​B&O Clay County to Gassaway will differ from the previous chapter in that most of this region is predominately more rural. A similarity with Part One is that the railroad has been physically gone for more than thirty years except for at the east end of the region covered in this segment. Familiar places to regional residents in this section will include Hartland, Clay, Dundon, Gassaway, and Sutton but also mentioned will be smaller name locations that were timetable entries and whistle stops for the B&O long ago. The most fascinating and certainly most mysterious sector of Part Two from a scenic aspect is between Queen Shoals and Hartland of which I will refer to as the Bends of the Elk. ​From a personal standpoint, I seldom saw this region when the railroad was active as a through route and have few firsthand accounts to share here. As an added consequence, historical records are sparse as are photographs. Images of the past will be added as they are obtained along with contemporary of my own as well as contributors recording the remnants of recent years. ​The B&O in this region proved to be a paradox in regards to a railroad traversing rugged but beautiful country following the crooked course of the Elk River bend for bend. 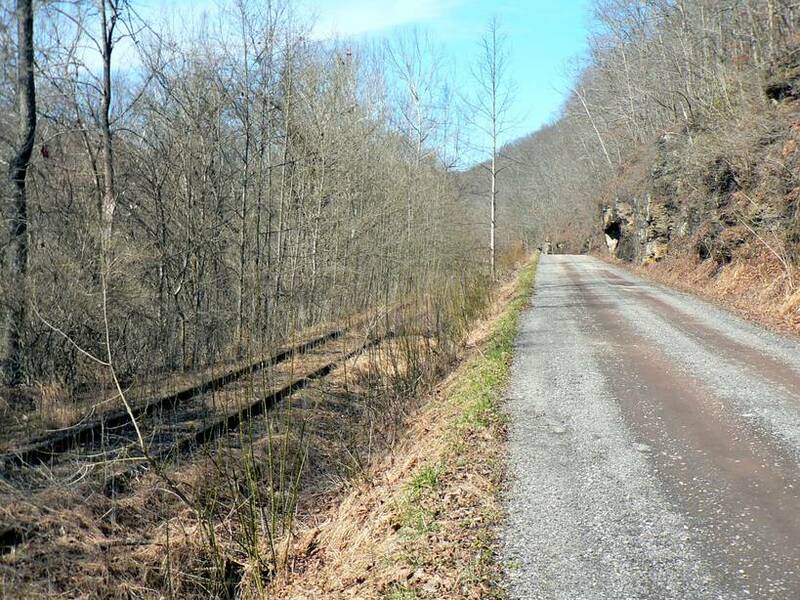 This scenic remoteness also rendered this stretch of railroad vulnerable due to few on line rail customers and especially so in the latter years. 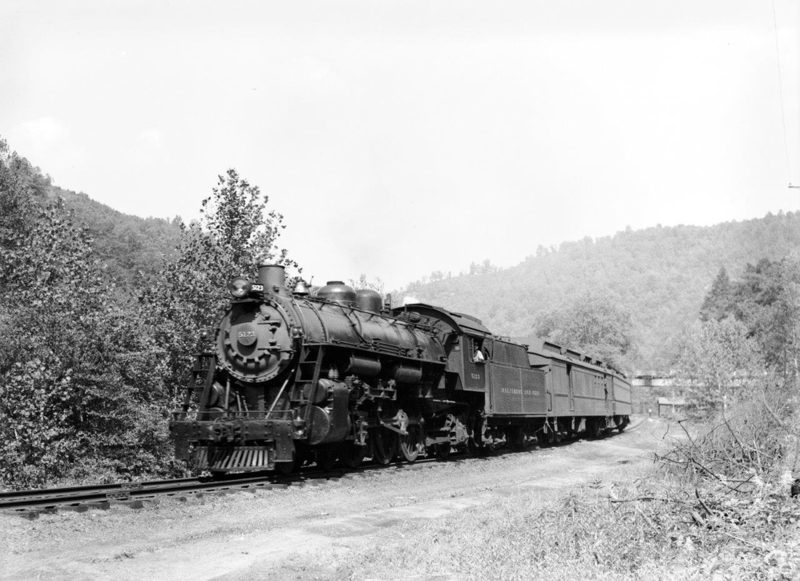 In bygone years when the B&O ran scheduled freights and operated passenger trains between Grafton, Gassaway, and Charleston, the line was a valuable north-south link through the heart of West Virginia. 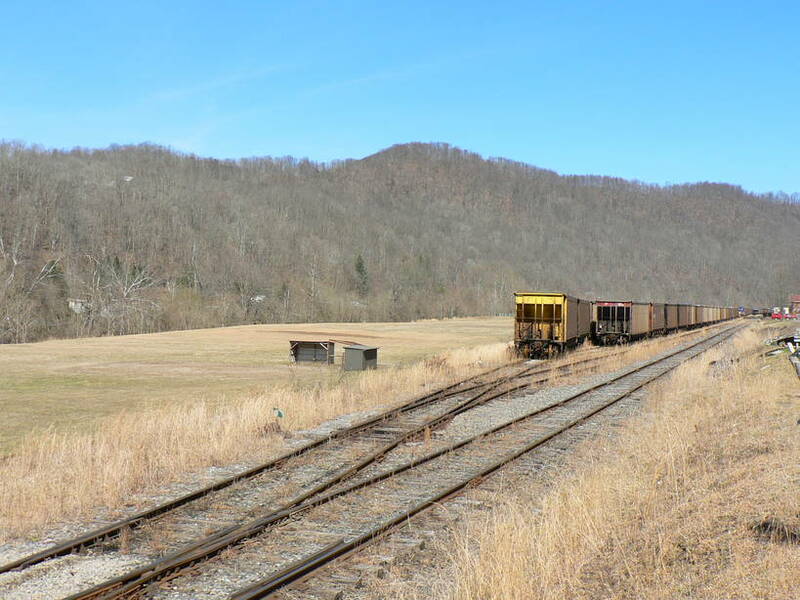 By the end of the 1970s, all that remained were a few shippers scattered along the route with none remaining between Clay to just below Clendenin. This resulted in a thirty mile section of railroad that B&O (Chessie System) deemed costly to maintain and therefore became expendable. 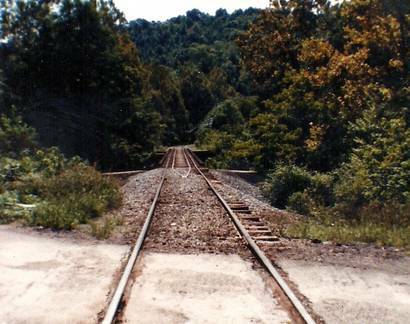 Since the remaining customers west of Clendenin could be serviced by the C&O from Charleston, the decision was made to sever the line and the track was removed between Hartland and Reamer in 1981. Six years later in 1987, the B&O (Chessie System) itself ceased to exist as it was among several roads that would vanish into CSX. Shortly after the formation of CSX, the former B&O from Gilmer through Gassaway to Hartland was sold and reborn as The Elk River Railroad (TERRI) of which it remains today. ​Hope springs eternal and during the mid 1990s, a phoenix almost rose from the ashes of a vanished rail line when TERRI announced a proposal to rebuild the railroad from Hartland to Falling Rock to secure a western outlet at Charleston. This was based on the discovery of additional mineable coal reserves in Clay County that would justify the rebuild. Unfortunately, the mining did not develop and this glimmer of hope faded which effectively ended any ideas of a railroad renaissance. Today, the song remains the same. Timing is everything. Thirty years hence, it obviously would have been easier to undertake this project when the railroad still existed in the region. If not, then unquestionably within a few years of the track abandonment when other related trackside features were still intact. 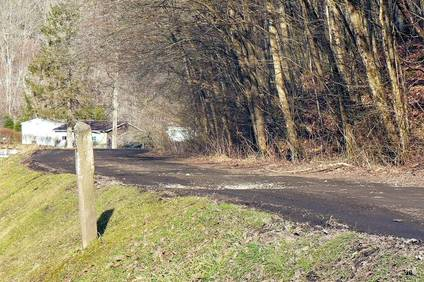 Although much is unchanged in the Elk Valley within this time frame, the former right of way has been converted to vehicle use at various locations thereby forever altering the integrity of the former roadbed. In addition, there has been property modifications that have wrought forth changes. With this in mind and to the best of my resources, presented will be reflections of the past interspersed with views as they are today both with the pen and lens. 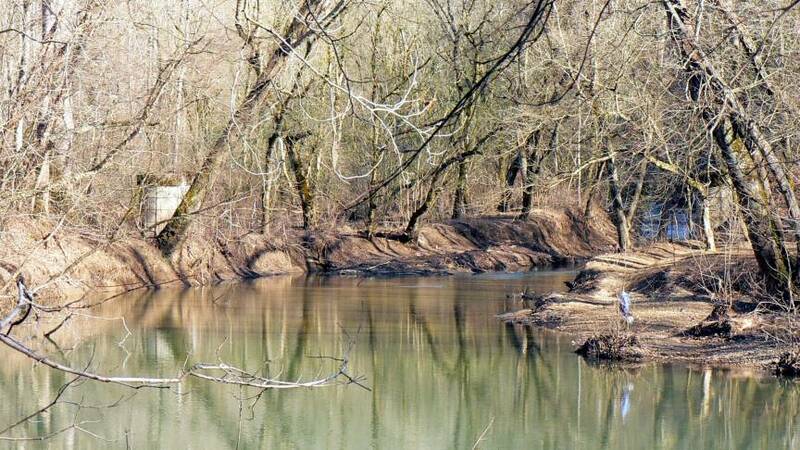 It is in this area east of Queen Shoals where the Elk River begins a crooked stretch of bends that extends for miles. 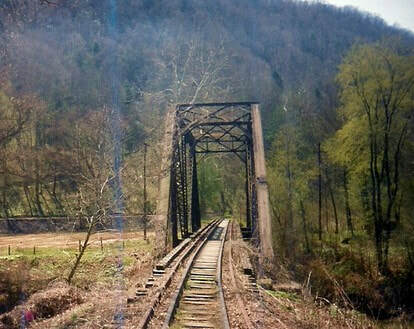 The river and railroad straddle the Kanawha and Clay County line entering and exiting both counties with each bend in the river. 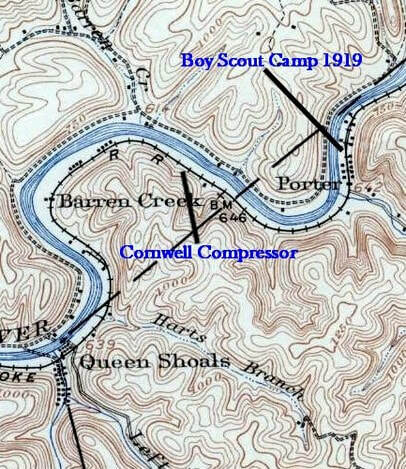 Prominent in this section is the Cornwell Gas Compressor and the community of Porter located at the mouth of the creek by the same name. The compressor station is actually listed as being located at Corton which is the place name on both sides of the river. 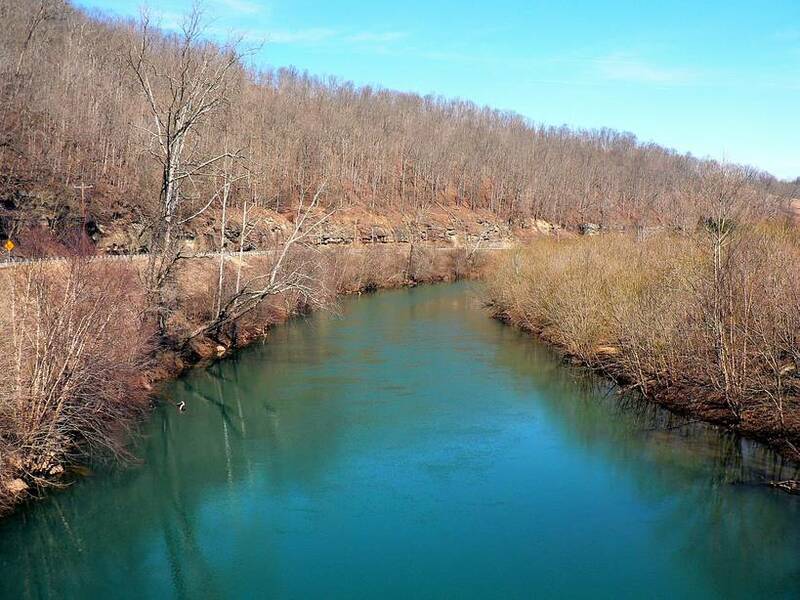 ​The topography of the Elk River valley undergoes a gradual transformation moving east from Queen Shoals. The hills increase in elevation, the valley narrows, and the river passes through numerous eddies and shoals. It is an area of few residences and begins the section of the Elk Valley that was and is prime territory for summer camps and retreats. 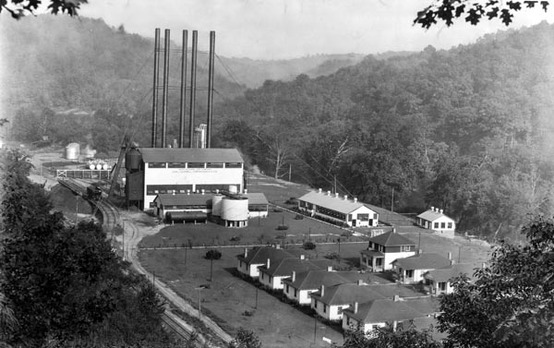 ​The Cornwell Compressor Station and its relationship to the railroad as it appeared circa 1930. The community of Corton was mainly comprised of employees that worked at the station. The compressor is still in operation but only a few homes remain in this small Elk River hamlet today. 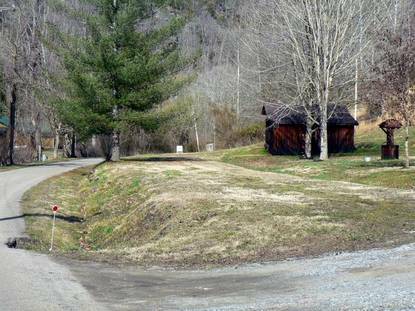 ​Porter was the quintessential small community along the Elk River and was representative of uncounted similar place locations that once lined the railroads of America. At the onset of the 20th century, Porter included a general store and post office in addition to existing as a whistle stop for the residents along the river here and the creek by the same name. 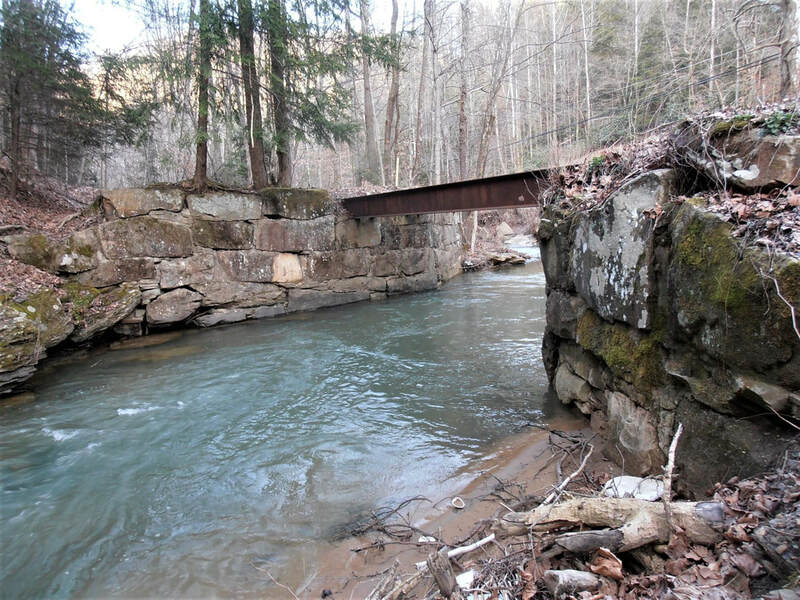 There once was a small railroad called the Porter Creek and Gauley that ran along the creek to tap into the abundant timber industry that once thrived in the vicinity. But this line must have vanished by the turn of the century since it is absent from the 1906 topographical map used herein. In conjunction with this small line was a bandsaw mill that was located near the mouth of Porter Creek. 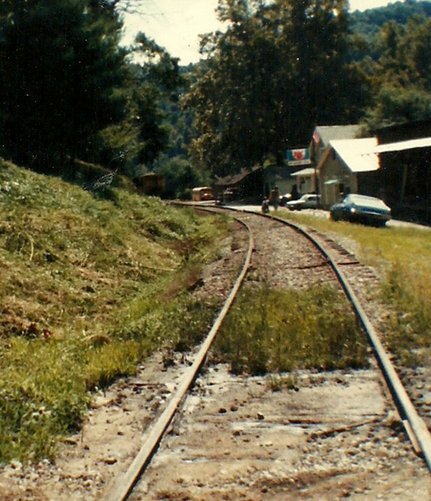 This line connected with what would become the B&O in later years at the namesake town of Porter. 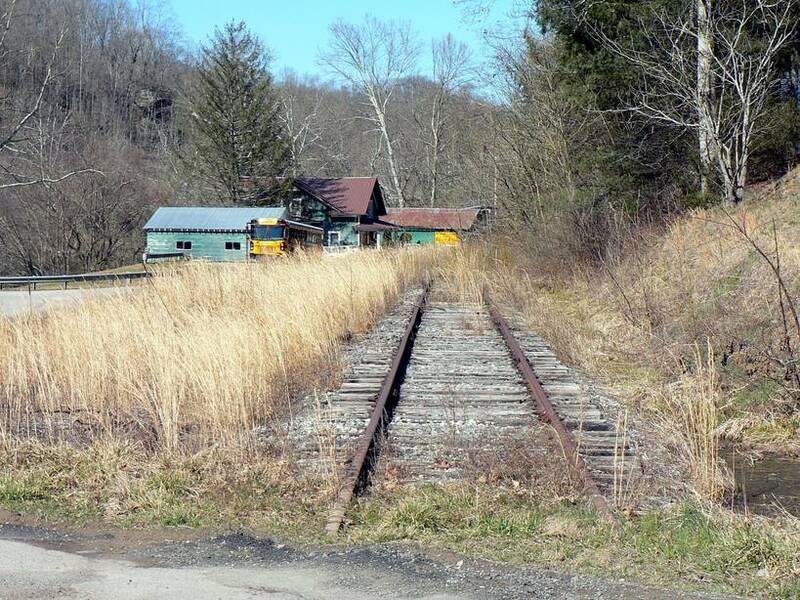 During the early years of the Boy Scouts, a summer camp was located here and they would travel to the area by train. The depot at Porter (B&O call letters OR) remained active until about 1950 when it was closed. ​A passing siding was located at Porter for train meets and undoubtedly was utilized for loads of timber coming off the PC and G when the line was active. This siding remained until the final years of the B&O although by this time train meets were long a thing of the past. It functioned as storage track for any shipments to the Cornwell Gas Compressor or to set out a bad order car. ​On an unrelated but noteworthy matter, Porter Creek holds a significant spot in the annals of horticulture. 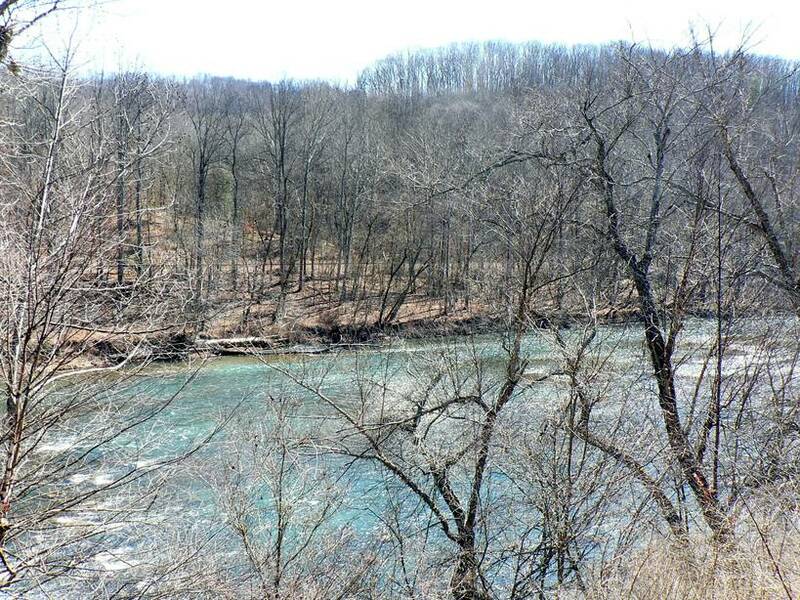 It was along this creek that the renowned Golden Delicious apple was discovered in 1905. Thoughts of noted author W.E.R Byrne’s descriptions freely come to mind upon thinking about the area between Queen Shoals and Hartland. His book, Tale of the Elk, is a compilation of short stories written during the 1920s of the early 20th century Elk Valley of which he so adored. His short stories recollect a long gone era of the families and life style of those who resided in the valley and the zeal for life and the outdoors is expressed most eloquently. Mr. Byrne was a distinguished Charleston lawyer but from reading the anecdotes in his book, it was fishing and the associations he had with so many along the banks of the Elk that gave him the greatest fulfillment. So much of the Elk River valley that existed during Mr. Byrne’s lifetime has remained intact and it is quite easy for one to visit these remote yet picturesque settings and understand the impressions cast on him so many years ago. The Elk, quite simply, is a magnificent stream defined by the placidity of its pools and the rapidity of its shoals. 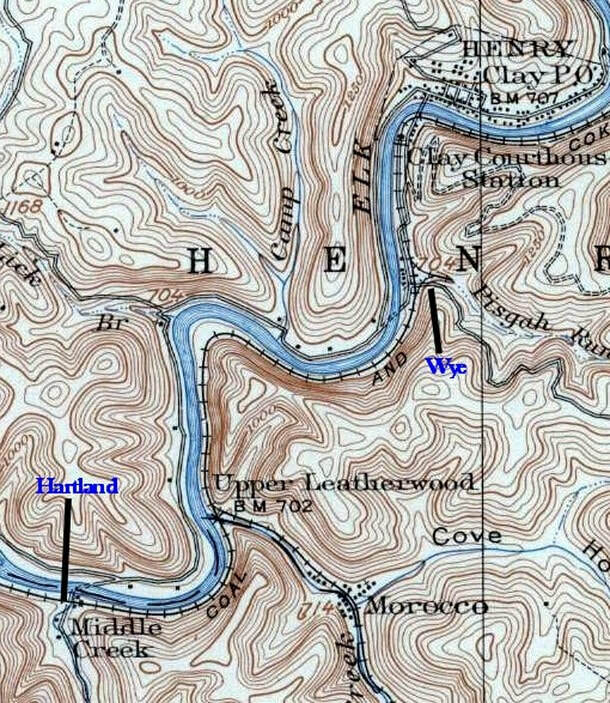 The region from east of Queen Shoals to Hartland, referred to as the Bends of the Elk in this chapter, is the embodiment of this state as the river twists around bends within a narrow valley. There was little on line traffic generated for the B&O and its predecessors in this section even during the early 1900s excepting for small coal operators. 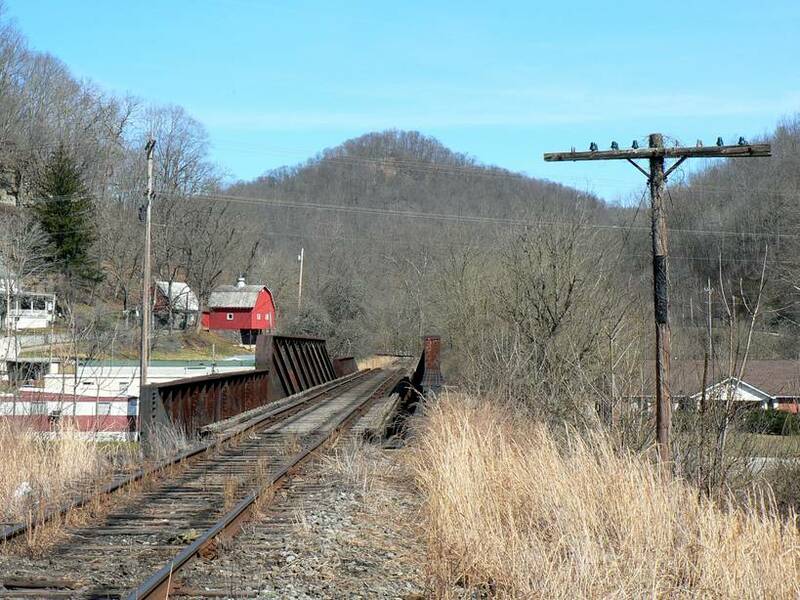 Most notable was the Middle Creek Railroad that connected with the B&O at Hartland and followed the namesake creek to Bickmore serving coal mines along the route. This five mile short line railroad remained active until 1951. There was also a logging line, Porter Creek and Gauley, which followed the watershed of the creek and joined the railroad at Porter. This small line had vanished by the early 1900s. Curious place names dotted the railroad along this stretch and among them were flag whistle stops such as Porter, Camp Procious, Rouzer, Shelton, Dorfee, Yankee Dam, Elkhurst, and Hartland. Population was (and still is) sparse with few residences and camps scattered along the line. 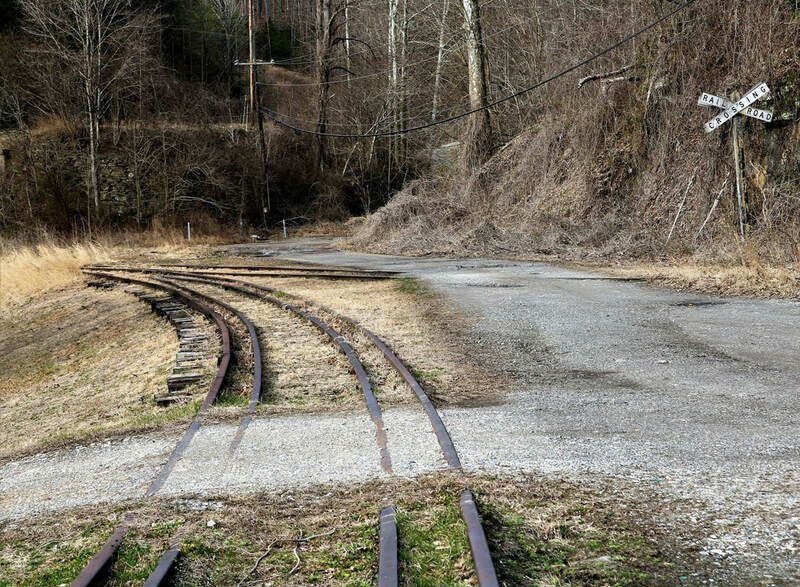 Although no industries other than coal mines were located adjacent to this winding stretch of track, the railroad did manage to install passing sidings on the brief tangents to accommodate meets which was paramount in the halcyon years when passenger trains graced the route. There were no less than five of these passing sidings—Porter, Rouzer, Shelton, Dorfee, and Elkhurst. By the 1970s, only the one at Porter remained. Due to the topography the railroad traversed with the ever twisting curves, maximum speed was 25 MPH and in the twilight years of operation, that limit was reduced to 10 MPH owing to lesser maintenance. Although a scenic vista, this section of railroad in the Bends of the Elk region was a maintenance nightmare. It was susceptible to rock slides, roadbed slippage, heavy snow, and fallen timber. Once the traffic evaporated and through Gassaway-Charleston trains ceased during the late 1970s, this roughly twenty-three mile stretch of railroad became expendable if for no other reason than eliminating maintenance. 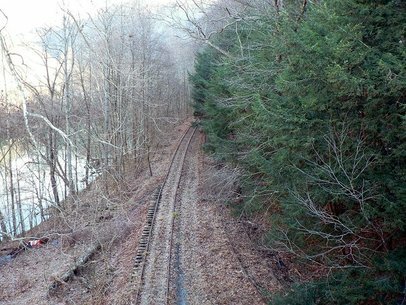 With no on line customers remaining, B&O (Chessie System) opted for abandonment and subsequently removed thirty miles of track in 1981. Only ghost trains traverse the Bends of the Elk today. In compiling images for this section, my regret is that I did not have time to take more photos. This area is difficult to access and daylight was ebbing quickly in addition to a considerable amount of territory to cover. At a future date, I will obtain more images in addition to archival ones that will be inserted. 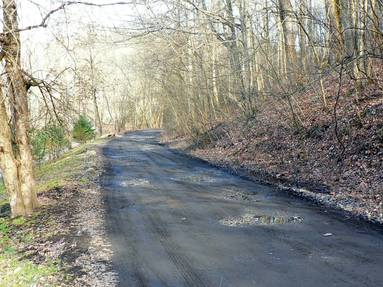 This location is where WV State Route 4 parts from the Elk River running east to bypass all of the bends thereby reducing highway mileage to Clay where it meets the river once again. The Camp Creek location is probably better known by Procious and in the distant past was referred to as Camp Procious. It is representative of the number of small communities that settled by the creek mouths along the river. The B&O main line passed through here but there is no evidence of any customers or sidings that existed here. This is the west gateway to the Bends of the Elk. ​Rouzer was a flag whistle stop for both the Coal and Coke Railway and later for the B&O in its early years of ownership of the line. 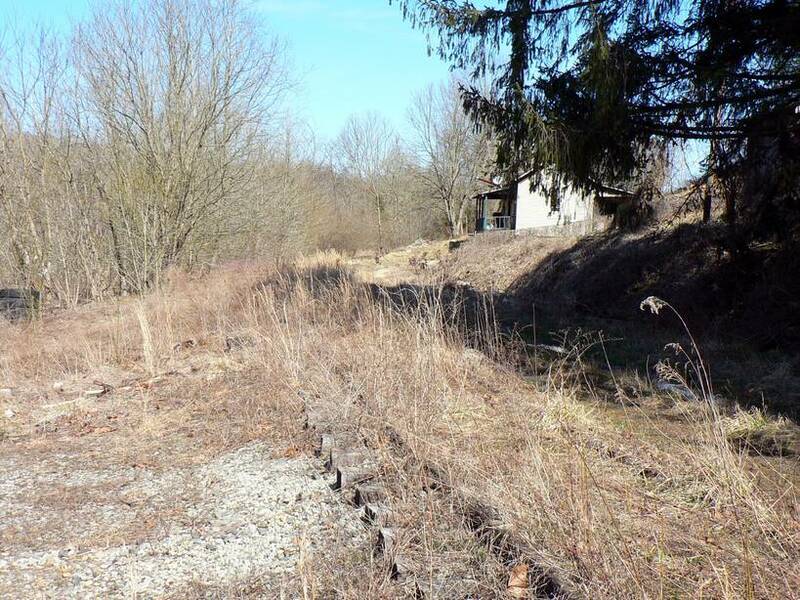 A passing siding was located here for train meets when traffic volume was higher and during the era of passenger trains. It was long gone by the latter years of the B&O. ​Originally known as Birch Run, this flag stop station once hosted a post office that in 1912 was run by a postmistress by the name of Mollie Procious. 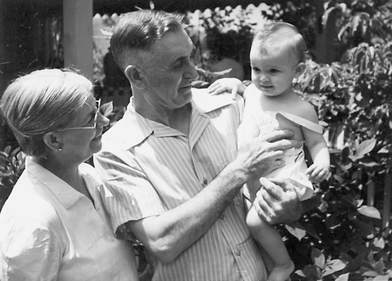 Shortly thereafter, Birch Run was renamed in her honor and the location simply became known as Mollie. Railroad timetables continued to list the locale as Birch Run so the name Mollie must have only been used by area residents and for postal purposes. Aside from this bit of trivia, the location held no special significance for the B&O as it was merely a location along the route. Mollie is identified on the topographical map in blue. ​​Shelton was another of the small place names located at a creek mouth. This tiny community, situated at the mouth of Little Sycamore Creek, was a location of a small station (B&O call letters SN) that was gone by 1938. The B&O had a passing siding located at Shelton that eventually disappeared with the decline of traffic. During the steam era, Shelton was also a water stop. On August 23, 1942, the world was in a state of chaos. Nazi Germany occupied the majority of Western Europe and was bogged down in the Soviet Union. In the Pacific Theater, America was battling the Japanese in the Solomon Islands at a place called Guadalcanal. Half way around the globe and in a dramatically different world, B&O train #87 departed Clay with twenty-five cars bound for Charleston. There was nothing especially out of the ordinary on this particular date except for the heavy rains the area had received. Train #87 was delayed in departing Clay but there was no overt concern except for that it would arrive in Charleston later than scheduled. Upon departing, the crew surely observed the Elk River and must have wondered if the recent rain would create any problems for residents and railroad alike. But trouble can be where one least expects and it would come not from the Elk River but from a tributary, Big Sycamore Creek. As Train #87, led by engine #2814, an E27c Consolidation, ran the track that followed the curvy contour of the river, little did the crew know what lay ahead. ​Eight miles west of Clay, Train #87 was running at 25 MPH as it passed one of the whistle stops in this remote area at Dorfee. 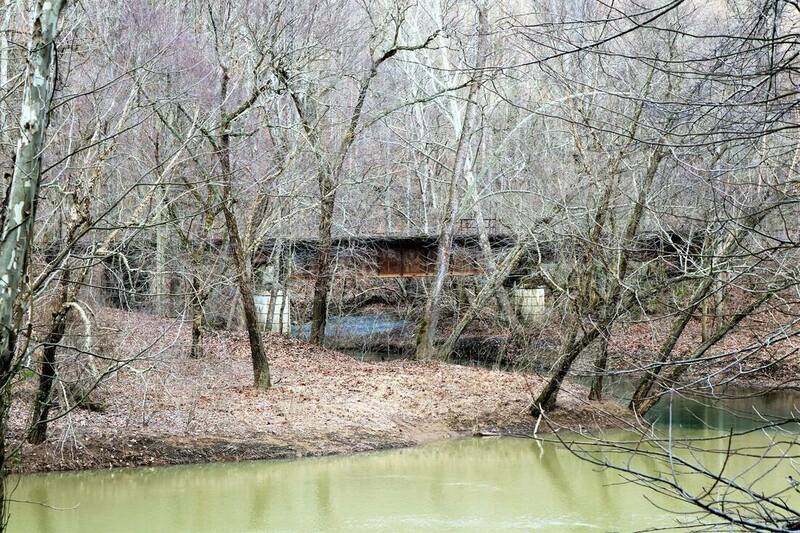 As the train approached the deck bridge that spanned Big Sycamore Creek, the engineer suddenly applied the brakes placing the train in emergency. 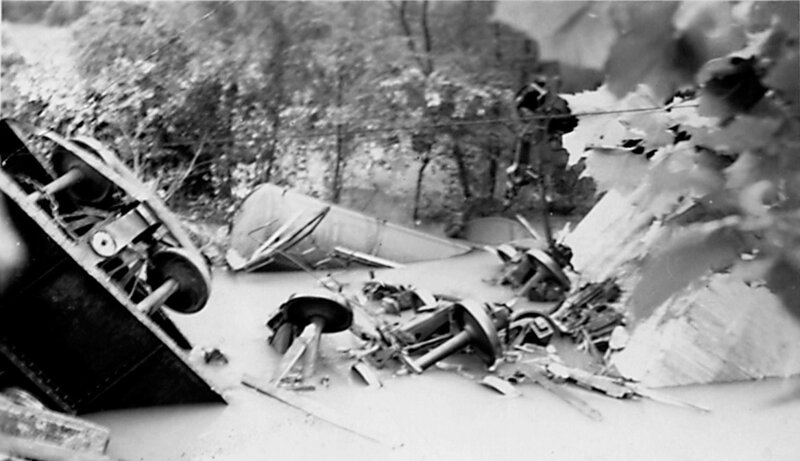 Upon hitting the east end of the bridge, engine #2814 suddenly leaned to the left and plunged from the bridge and lodged in the creek bed on its left side towards the west end of the bridge. Eleven of the twenty-five cars left the track and followed the locomotive into the creek creating an abysmal mess as cars piled upon each other with a number of wheel trucks breaking loose and scattering about. 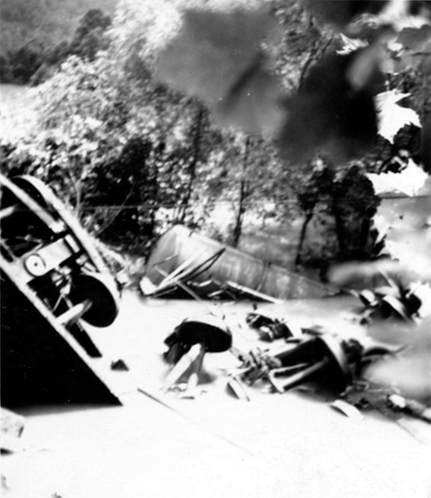 ​Above and below: A series of photos capturing the aftermath of the tragic derailment at Big Sycamore Creek in August 1942. These images contributed courtesy of Annie Bradt whose grandfather was the engineer who perished on that fateful day. 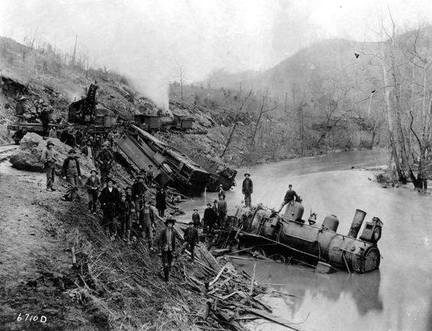 ​Tragically, of the five man crew on this train, three lost their lives in this accident---the engineer ("Pat "Paisley), fireman, and front brakeman. The conductor and flagman survived without injury having been at the rear of the train in the caboose. 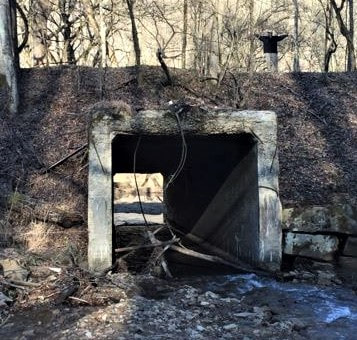 ​Extensive investigation determined that the cause of the derailment was a structure failure on the Big Sycamore Creek bridge, identified as Bridge 41.1 by the railroad. High water caused by the recent heavy rains had undercut the east pier of the bridge rendering it with no support. When the locomotive hit the east approach, its weight caused it to simply roll over to the left. The pier washout had occurred rapidly for another westbound train bound for Charleston crossed the bridge four hours earlier without incident. ​The area at Dorfee and Big Sycamore hosted coal mining activity during the early 1900s. 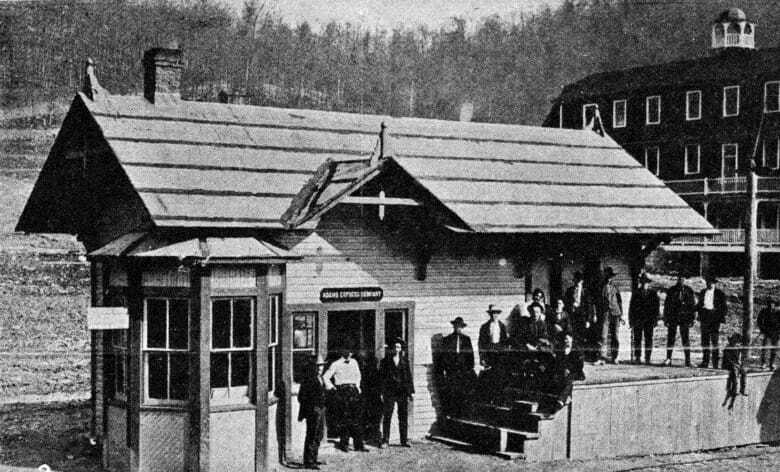 Two recorded operators and shippers here were the Kanawha White Ash Collieries and the Thompson Block Coal Company. An exploration of the area may reveal telltale clues of their one time existence. 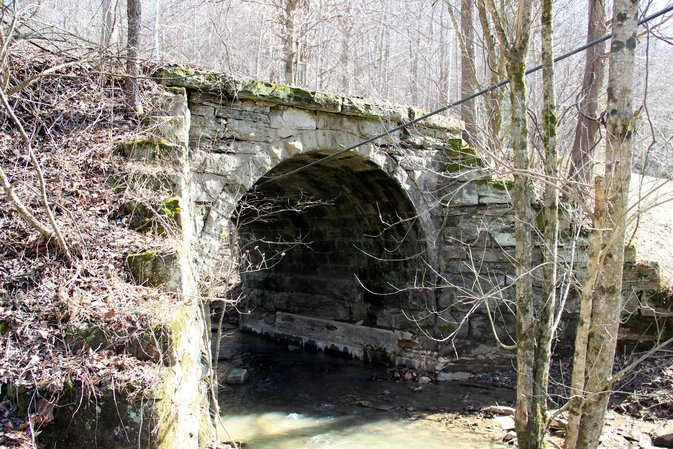 During the 1830s, a group of settlers from the Northeast moved into the area and constructed a dam in the Elk River in the vicinity of Blue Knob Creek. 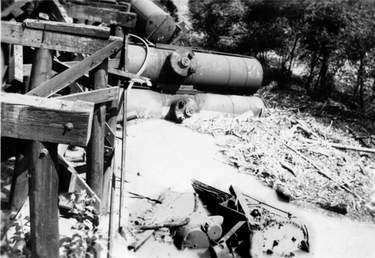 A mill and factory were also built and lasted until it was washed away by flood waters . Later, another group of people from Nova Scotia settled in the area, rebuilt the community and the name was changed to Elkhurst. Coal mining existed here during the early 20th century and at least three separate companies operated here. The listing includes the Big Block Coal Company, Elkland Coalmining Company, and the Jones-Winifrede Company Steidal mine. ​n 1950, the Cold War was in full bloom and it had become hot due to the erupting conflict in Korea. The southern portion of the peninsula had been invaded by northern Korean Communists but appeared to have been thwarted by United Nations troops. By the autumn, all indications were that the hostilities would soon end and the crisis resolved. On Thanksgiving weekend, it all changed. A massive invasion by the Chinese intensified the conflict and ensured that war would continue. On that very same weekend, B&O passenger train #136 departed Charleston, WV and would soon engage in a battle of its own. The enemy it faced was Mother Nature and she was to manifest herself in the form of one of the largest snowfalls on record. In an odds defying case of deja vu, nearly identical circumstances had occurred six years earlier 1944 with another eastbound passenger train from Charleston. The Thanksgiving weekend of 1950 began with rain that with the dropping temperatures quickly changed to snow. And it kept snowing all night and into the following day in the form of white blankets. Soon, all communication was lost but Train #136 although delayed departing Charleston, commenced on its run to Grafton. As the train ran eastward, the heavy snow had created drifts and by the time it reached Clendenin, the depth of the snow increased considerably. 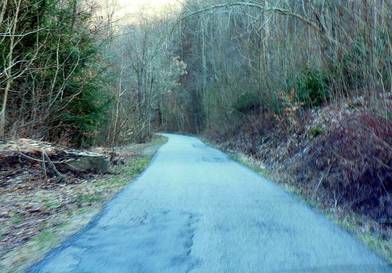 The Elk River line hugs the south bank of the river and as one travels eastward from Clendenin, the hillsides adjacent to the track become steeper creating pockets for heavy snow drifts and accumulation. There is also the danger of falling timber from the weight of the snow. Train #136 on this day faced a decision whether to continue on to Grafton and due to the number of passengers, it proceeded east. 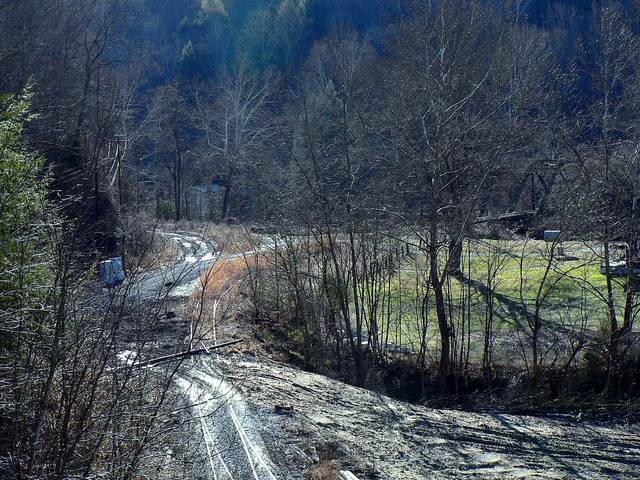 ​Once in the remote region between Clendenin and Clay, the train encountered heavy snow drifts and stopped on occasion to clear fallen trees. Another concern facing the crew was that the steam locomotive was nearing an alarmingly low water level. The crew decided it best to pull the train into the siding at Elkhurst. As time passed, there was growing concern in Gassaway as to the whereabouts of the train. Since communication was down, its location and disposition was a mystery. Train #136 was lost. 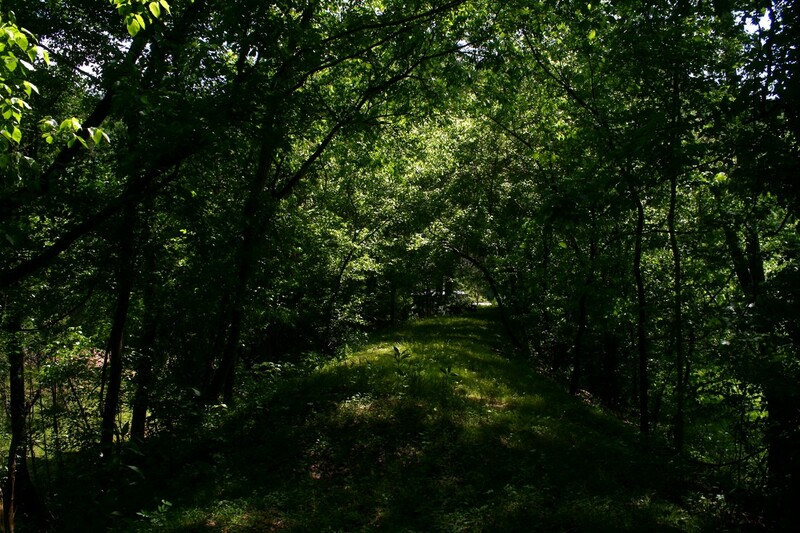 ​The following morning, a search train was dispatched from Gassaway in search of the lost train. Not only was there danger of the track condition, but running the line blind and meeting #136 head on was a concern as well. The search train ran as far west as Clay as it, too, encountered snow drifts and fallen trees and the hunt that day ended. The quest for #136 resumed the next morning. Upon the return to Clay the next day, the train had not passed but it was determined be located several miles west at Elkhurst. The search train continued onward to that location whereas the #136 was discovered virtually buried in the snow. Obviously, the primary concern was for the crew and passengers but the crew had managed to keep the locomotive under fire to provide heat and security from the elements. Food had been provided by the Elk River Coal and Lumber Company and coffee from the Girls of the Elkhurst 4H Club. Finally on the next day, a relief train arrived and took the #136 on to Gassaway ending a saga that for all who had been involved would not soon forget. The 1907 topographical map caption here focuses on the area from Hartland to Clay. Note on this map from the Coal and Coke Railway era that Hartland is referred to as Middle Creek and that there is no rail line following that creek as the Middle Creek Railroad had not yet been built. The town of Clay was known as Henry then Clay Court House (railroad listing) and ultimately, simply Clay. 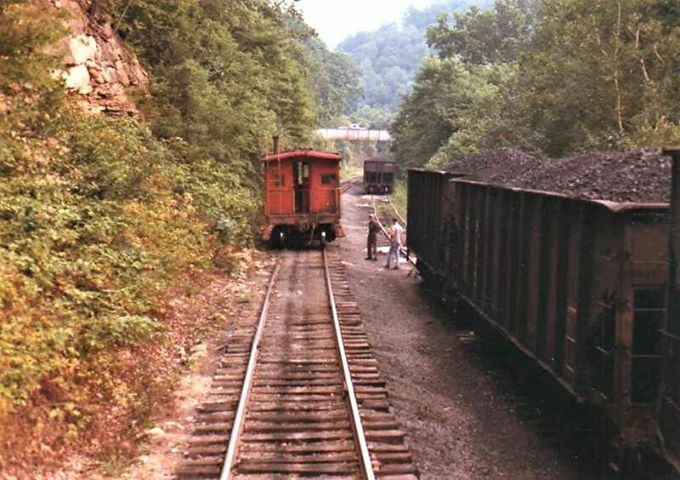 The Middle Creek Coal Company operated four mines----LeMoyne, Rainbow, M.L.C, and Osborne--- along a branch line that went by the same name, the Middle Creek Railroad, which began operating in 1925. Connecting with the B&O at Hartland, it ran several miles to the Clay County community of Bickmore. This operation generated coal traffic for the B&O until 1951 when three of the mines closed down. 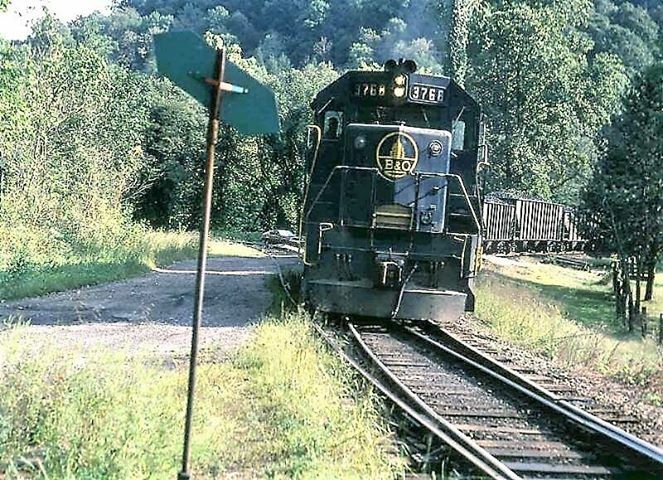 The B&O continued to serve the one remaining mine (LeMoyne) until it played out and the trackage of the Middle Creek Railroad was officially abandoned in 1965. 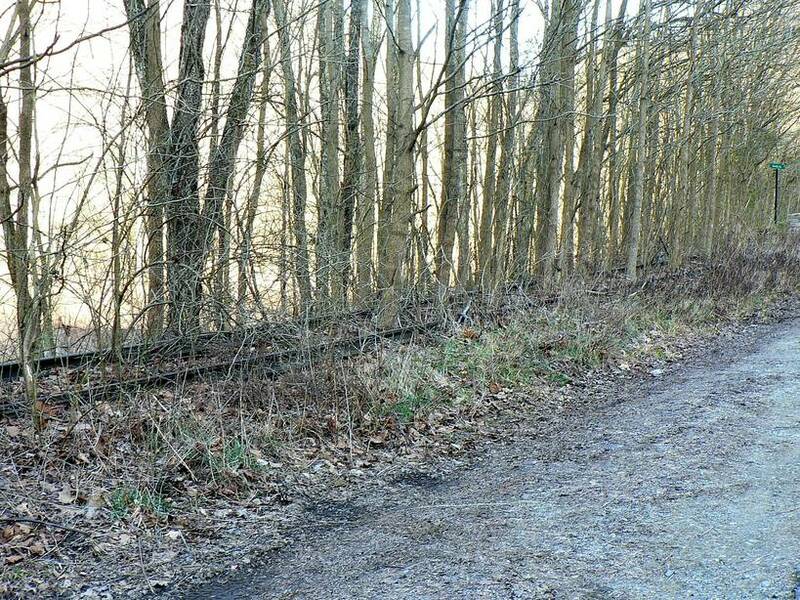 ​When the B&O filed for abandonment of its line between Hartland and Reamer twelve years later, this location became the end of the line that extended west from Gassaway. 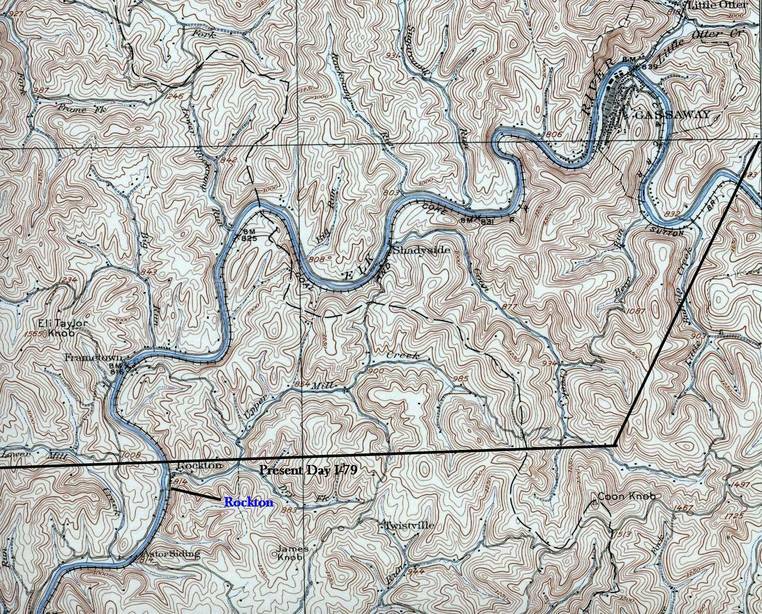 It is curious that Hartland was selected as the sever point since there was no on line traffic from it eastward through Clay to Dundon at the junction of the Buffalo Creek and Gauley. Apparently, B&O (Chessie System) elected to keep the line intact from Clay to Hartland in the event any mining would redevelop along Middle Creek. Aside from this possibility, there would appear to be no other reason to as to why this stretch of track remained. 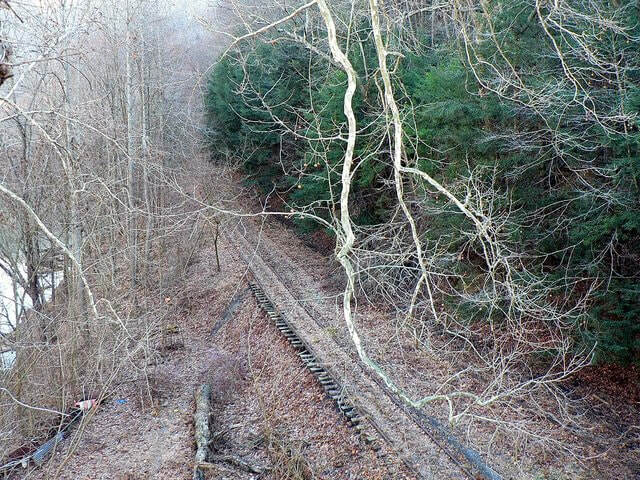 ​Today, track remains at Hartland but is in severely dilapidated condition from non-use and maintenance for many years. Perhaps the last train ever to be at this location was in 1981 when the track removal was taking place. 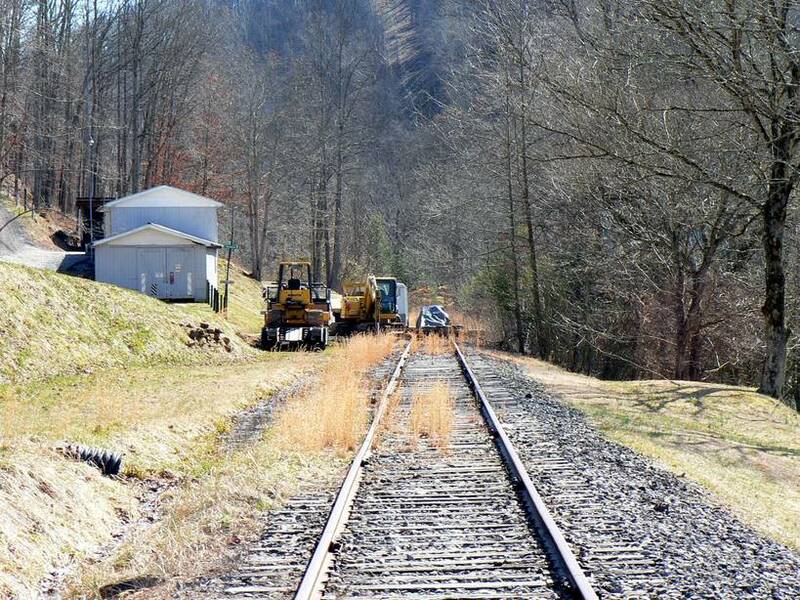 The railroad and right of way here now is under the ownership of TERRI (The Elk River Railroad) which acquired the ex-B&O trackage from Gilmer to Hartland during the early 1990s. ​Located roughly at the midway point of the railroad between Charleston and Gassaway, Clay was a prominent location along a line that was dotted with small towns and sparse population. 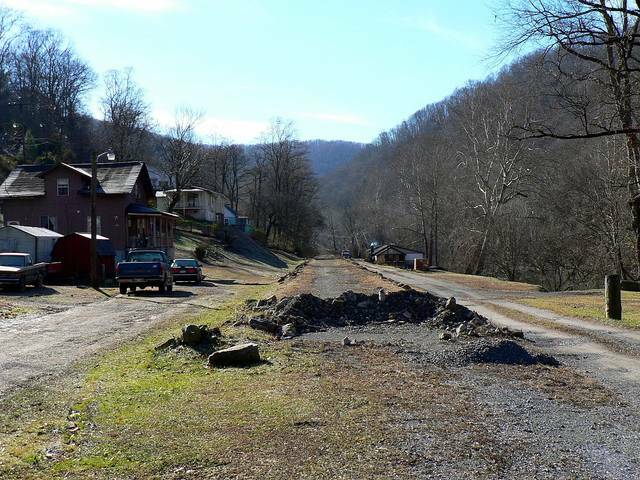 Incorporated in 1895, it is the only other community aside from Clendenin with that distinction between the two endpoints. As was the case in the naming of many counties and communities in the early history of the United States, the origin was often a notable individual. “The Great Compromiser”, Henry Clay, prominent 19th century United States Senator and Vice President, is the namesake for both the town and county here. ​Looking east through the town of Clay as it appeared in 1917. The court house is visible at left with homes spaced about on the north bank of the Elk River. 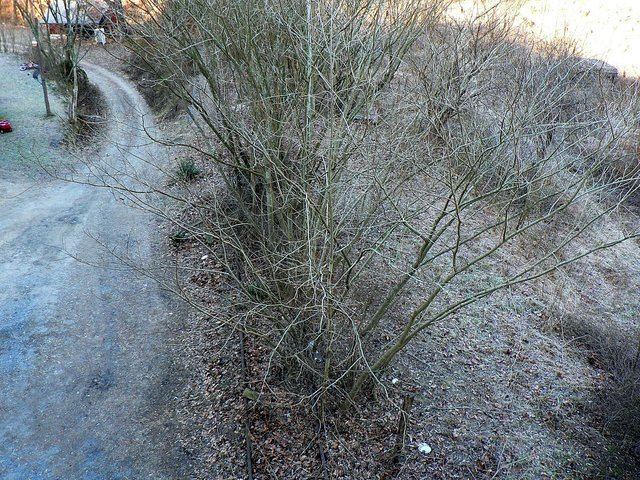 This was the era that B&O took control of the Coal and Coke Railway and the railroad is visible on the opposite bank of the river. Not visible (unfortunately) in this scene is the Clay depot. Image West Virginia Geological and Economic Survey. ​The heyday for Clay in relationship to the railroad was when the passenger train was in full bloom. Although it lies in a region rich with natural resources there was little online business for the B&O generated here despite its strategic location between two branch lines that connected to the railroad. 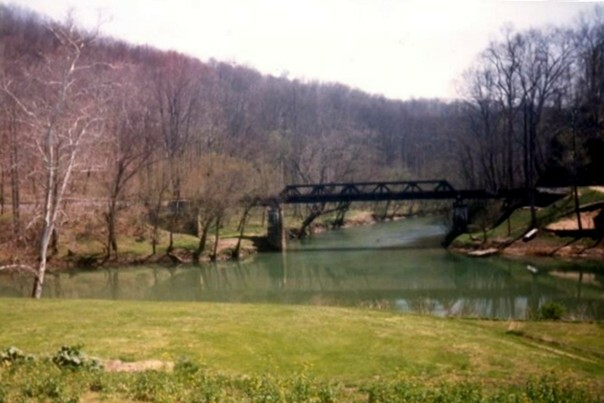 The Middle Creek Railroad to the west at Hartland and the much larger Buffalo Creek and Gauley to the east at Dundon flanked the town of Clay in terms of the railroad. 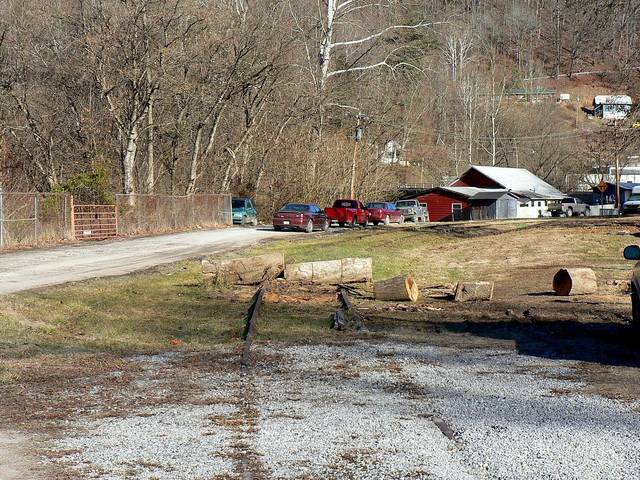 At the turn of the century, there was also a logging line that ran along Leatherwood Creek just to the west of town at Upper Leatherwood. Along with a depot (B&O call letters SO), a passing siding was located here and at the west end of town, a wye was constructed to turn steam locomotives for runs east or west. In its 1948 listing of industries, B&O named York Mine No.1 and the Maryland and West Virginia Lumber Company as customers in the vicinity. 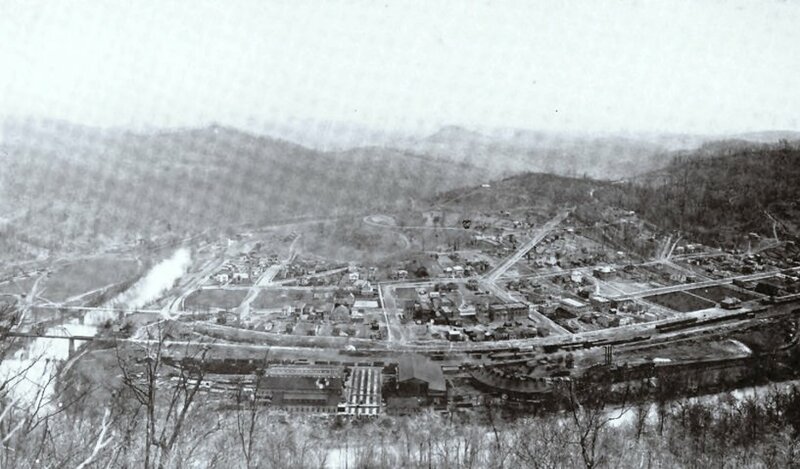 Earlier coal firm shippers included Clay-DeBerry Leonard Mine and the Standard Kanawha Coal Company. Ironically, the larger part of Clay was located on the north bank of the Elk River opposite the railroad. When the community was established, this side of the river had the wider plain in the narrow valley and the development was greater than on the south bank. Of course, this predated the construction of the railroad but as a result, the main body of Clay was not traversed by the railroad. 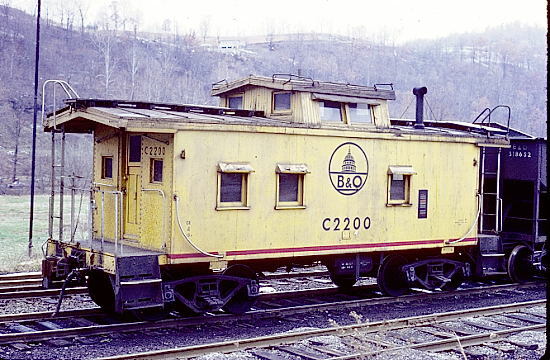 ​Today, traces of the B&O exist at Clay although ownership is now under the Elk River Railroad. The track here is in a ruinous state and has been removed at sporadic locations in the area by other entities. 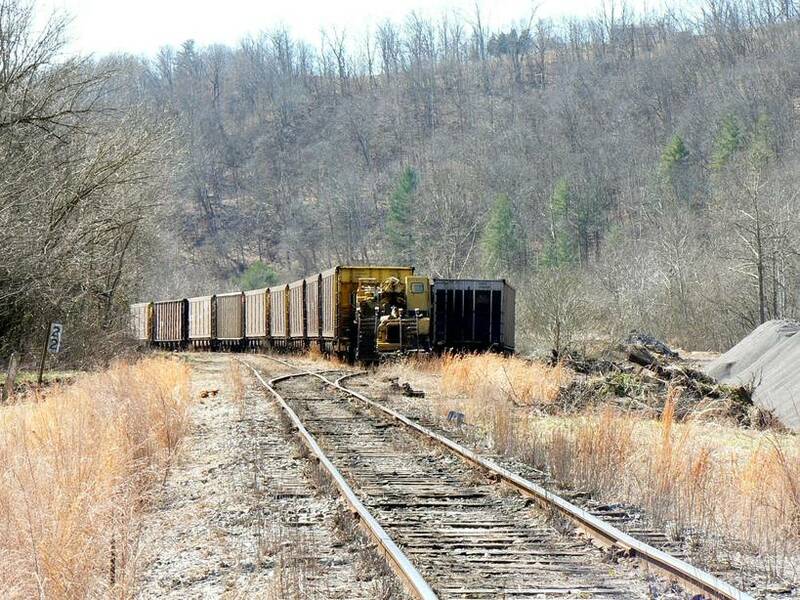 Realistically, if the Elk River Railroad (TERRI) ever reactivates the railroad west of Gassaway, the section from Dundon to Hartland likely would not be rebuilt to operational standards. The real pot of gold for this to occur would be a complete rebuild west to the Blue Creek area to secure a route to Charleston. Considering all circumstances and present economic climate, it is more fantasy than probability. ​The region of the railroad between Dundon and Gassaway was the busiest both during the Coal and Coke years and later the B&O. 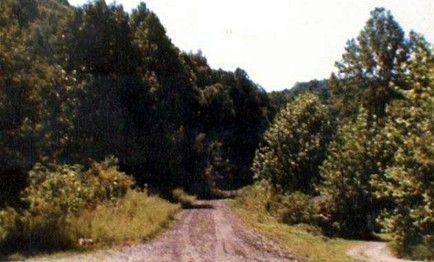 It is also the best known and documented section of the route between Charleston and Gassaway due in no small part to the Buffalo Creek and Gauley Railroad and its connection at Dundon. 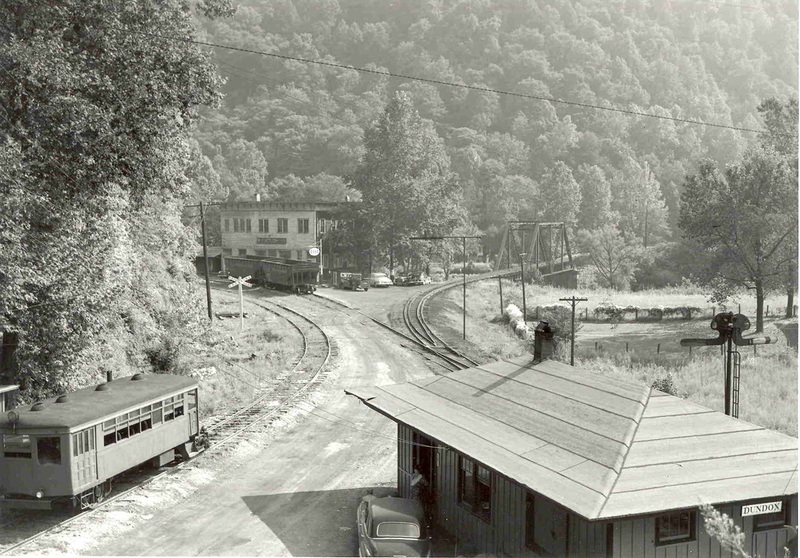 The Buffalo Creek and Gauley (BC&G) was among the most unique short lines to operate in America generating car loads of coal to interchange with the Coal and Coke, B&O and, finally, the Elk River Railroad. It was also a mecca for railfans during the late 1950s through early 1960s due to its use of steam locomotives after the Class I railroads had already transitioned to diesels. Gassaway was the hub of operations for both the Coal and Coke and later B&O. It was the prototypical small town centered on the railroad in that its fortunes were directly aligned with it. The steam era years were peak as this translated into more operation which equaled more jobs. Once the B&O converted to diesel power, facilities were eliminated, and with the passing of years, the tempo of operations declined. 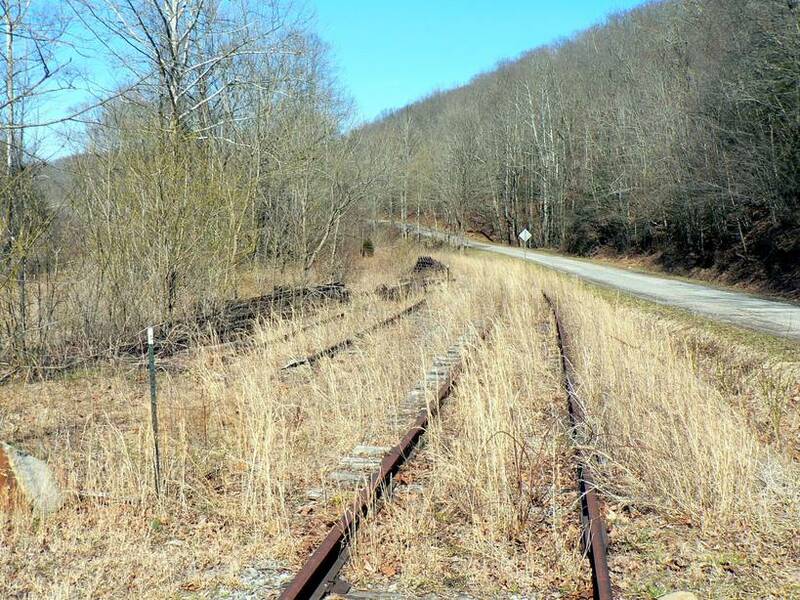 By the 1980s, Gassaway was but a shell of its former self and once B&O/Chessie System was consolidated into CSXT, the existence of the railroad along the Elk itself was in jeopardy. 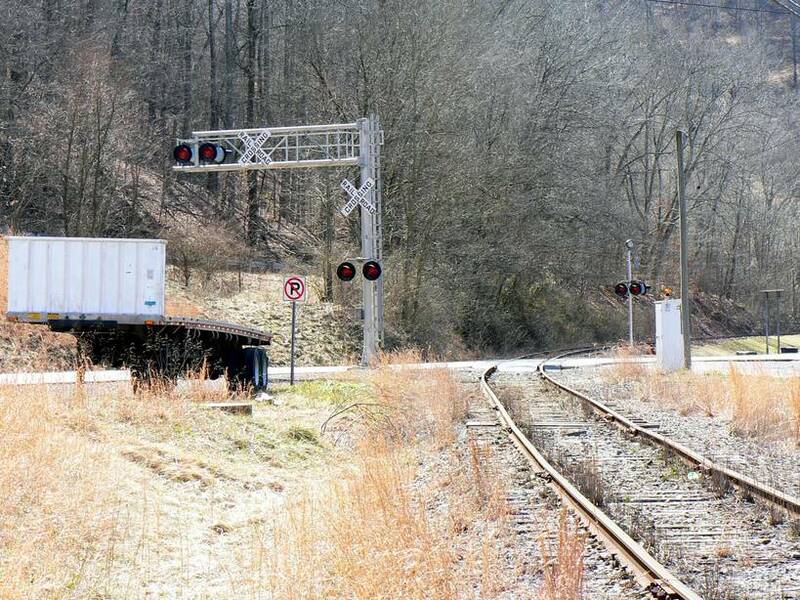 CSXT was quick to shed the remaining B&O from Gilmer through Gassaway west to Hartland. 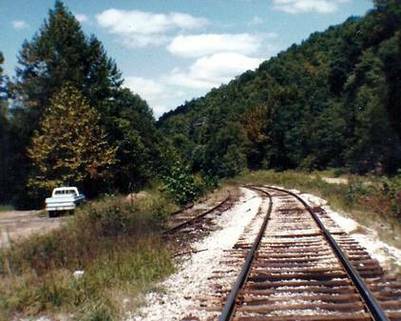 Had not the Elk River Railroad (TERRI) been formed, fate would indicate that this remaining track would have been scrapped. 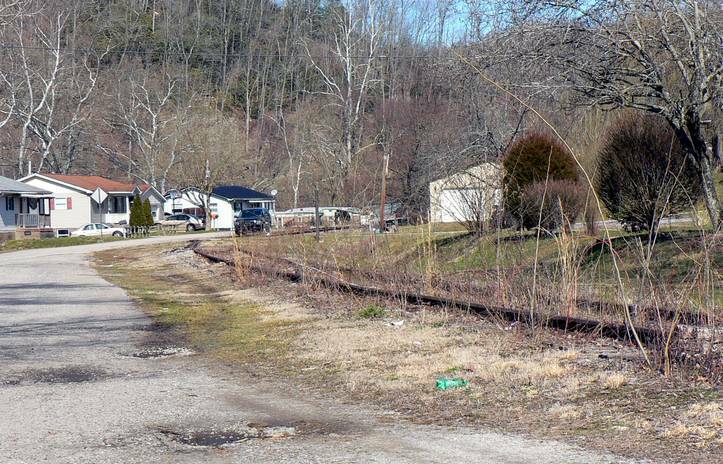 Today, the railroad lives on in a near state of dormancy with car storage in the Gassaway and Frametown area as the only source of revenue. TERRI hopes for the day when revenue trains can run the line once again although with the current political, environmental, and economic climates, that day is clouded within a pipe dream. 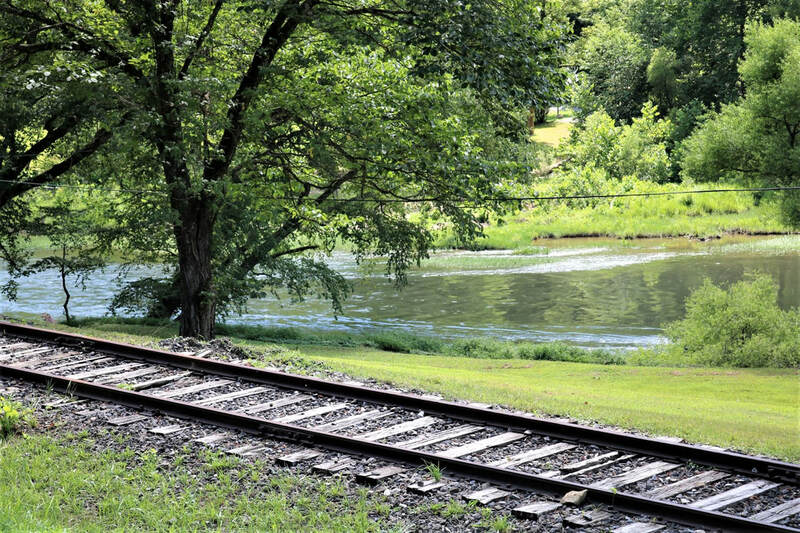 Between Dundon and Gassaway, the railroad echoed the scenic Elk River bend for bend passing through small communities with colorful names and charms of their own. 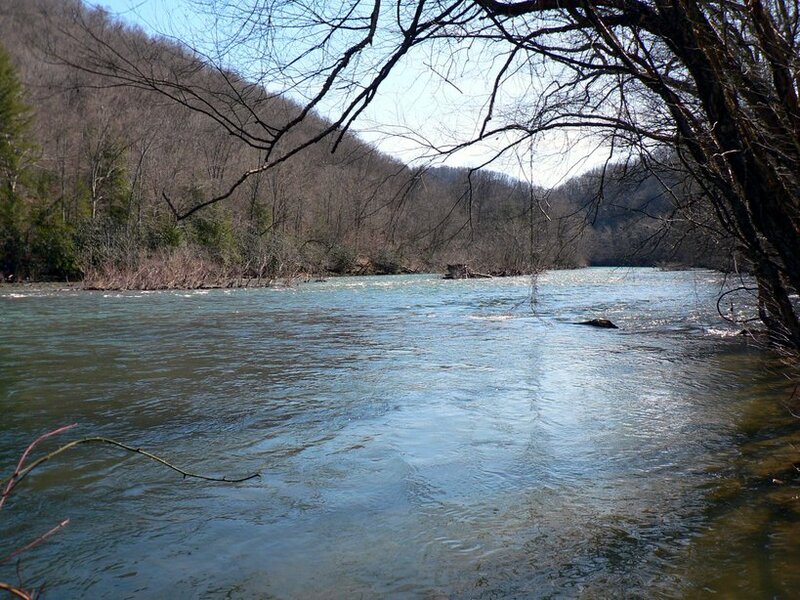 Place names such as Otter, Groves, Duck, and Strange Creek can be found along the river passing through Clay and Braxton Counties. As with the region west of Clay, most of these are situated at the mouth of creeks and were of more importance to the B&O during the era of passenger trains. The area covered in this chapter except for Dundon is one I seldom saw except for the early 1980s when my work would occasionally direct me to this region. My recent outing to photograph specific locations was the first time I had revisited the area in more than twenty years. This section of the 1908 topo map focuses on the railroad just east of Clay to past the bend beyond the Spread passing siding. 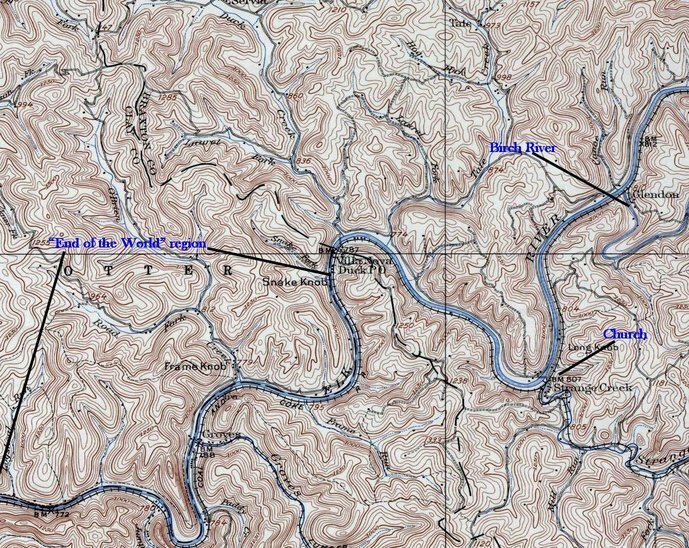 Without question, the highlight here is at Dundon and the connection with the Buffalo Creek and Gauley. The wye connection is noted at Dundon as it existed during the Coal and Coke Railway era. Aside from the wye removal, all else here remained the same during the B&O tenure. Google Earth view of the B&O/Buffalo Creek and Gauley Railroad junction at Dundon and surrounding topography. Once the busiest location on the B&O between Charleston and Gassaway, coal from the Clay County mines funneled to the B&O from the BC&G and successors for many years. A wye once existed here with a track leg connection on the west bank of Buffalo Creek. 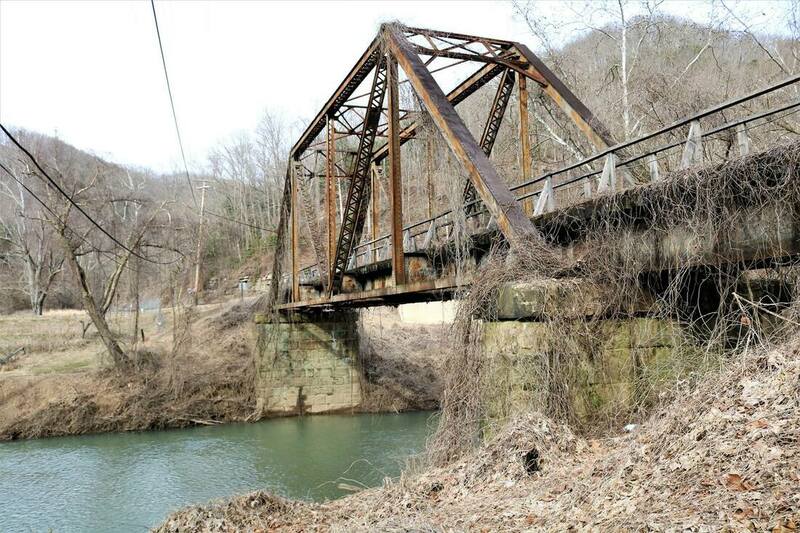 ​With the possible exception of Gassaway, no location along the B&O Elk River route was more notable than Dundon. The irony here is that the centerpiece was not the B&O itself but the connecting short line Buffalo Creek and Gauley instead. The BC&G was a unique railroad by any measure. 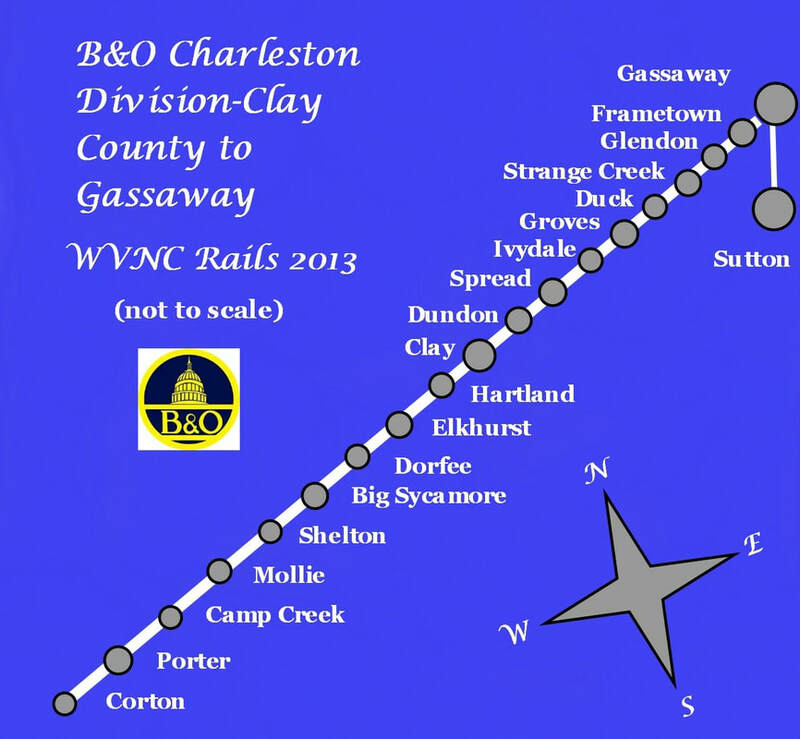 First of all, it was the largest source of traffic for the B&O between Charleston and Gassaway. More notably, it earned a special place in the accords of rail enthusiasts as it operated steam locomotives after the B&O and the other Class I railroads had switched to diesels. During the late 1950s until the end of steam on the BC&G in 1963, Dundon was a rail hotspot with fans nationwide visiting and watching the operations. This was the true testament despite an era when the region was more difficult to access predating the Interstate highways. Not be lost in the shadows of the BC&G, the Elk River Coal and Lumber (ERC&L) line connected with the BC&G and contributed to the interchange traffic to the B&O. 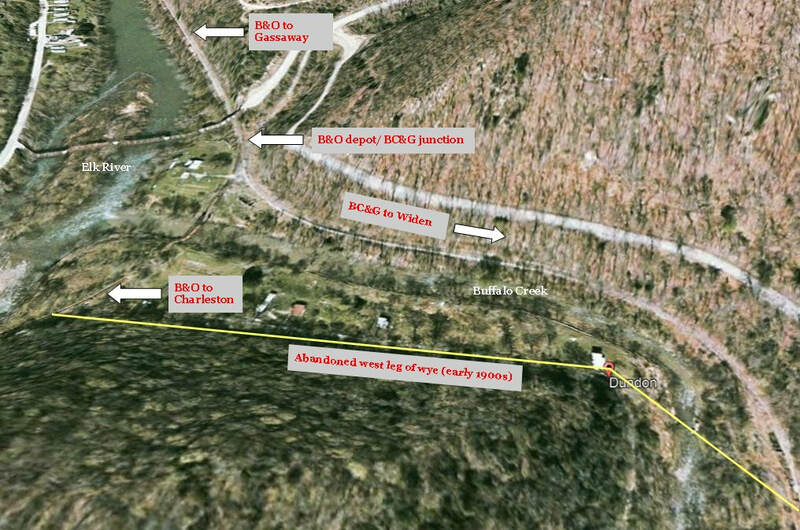 As for the B&O operation at Dundon, it was effectively an interchange point for the BC&G. The loads moved east to Gassaway with empties moving west on the return. The siding at Dundon was heavily used by both BC&G and B&O for staging cars and to run around them. In the distant past, there was a wye at the Dundon interchange. 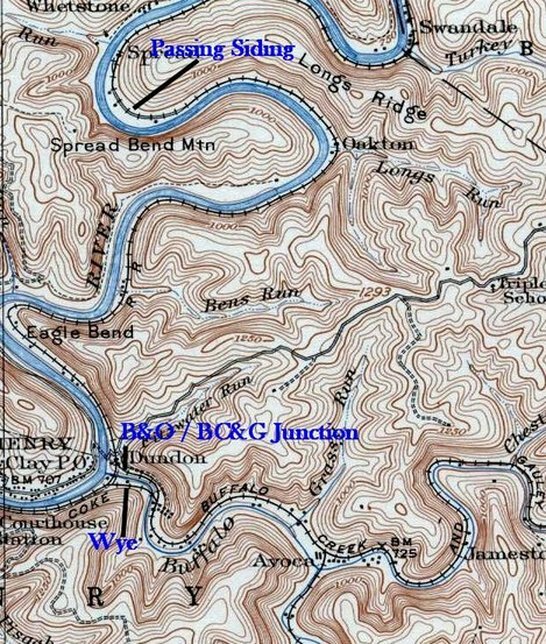 The north leg connected to the B&O west of the Buffalo Creek bridge then crossed the creek to connect with the BC&G main. This connection was removed leaving only the eastern junction on the east bank of Buffalo Creek near the Dundon depot (B&O call letters DU). Dundon was a passenger train stop with the Coal and Coke Railway and lasting through the B&O era of passenger service. I will defer the operations of the BC&G here as there are other sites and books that give it the detailed scrutiny that it deserves. 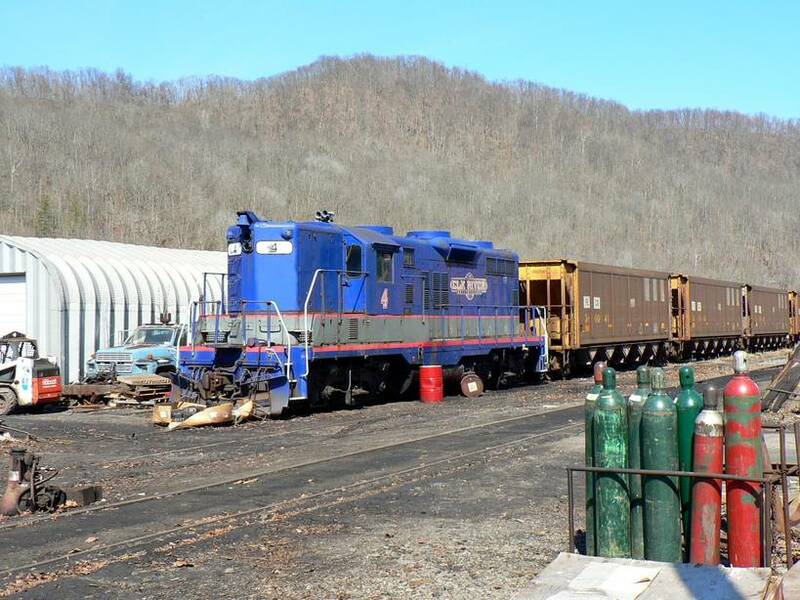 Listed in the closing credits of this page will be sources that will direct the reader who is interested in reading about the Buffalo Creek and Gauley and the Elk River Coal & Lumber RR. ​B&O fortunes at Dundon mirrored the BC&G. 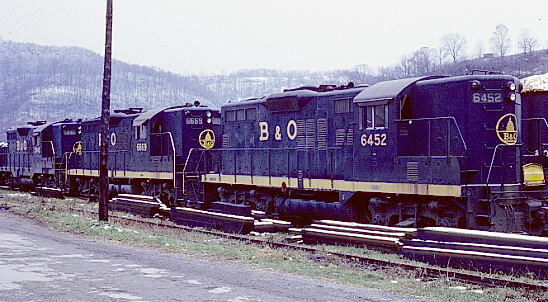 When the BC&G operated, the B&O had business there. 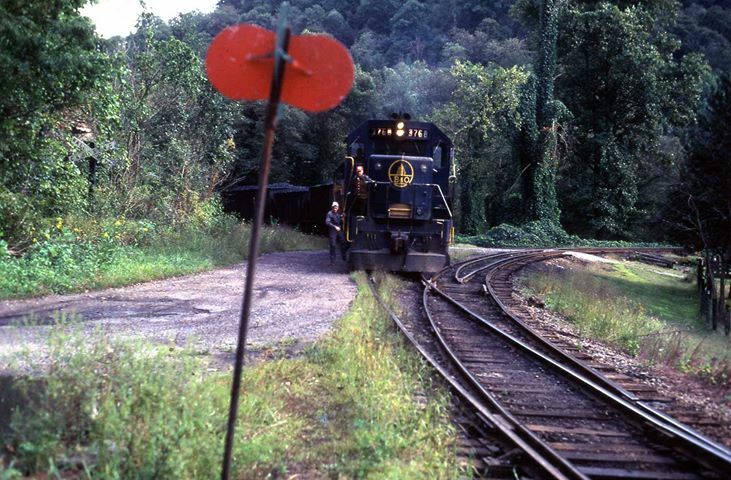 When the line closed in 1965 until reopening with Majestic Mining in 1971, Dundon reverted to a place name trains passed between Charleston and Gassaway. 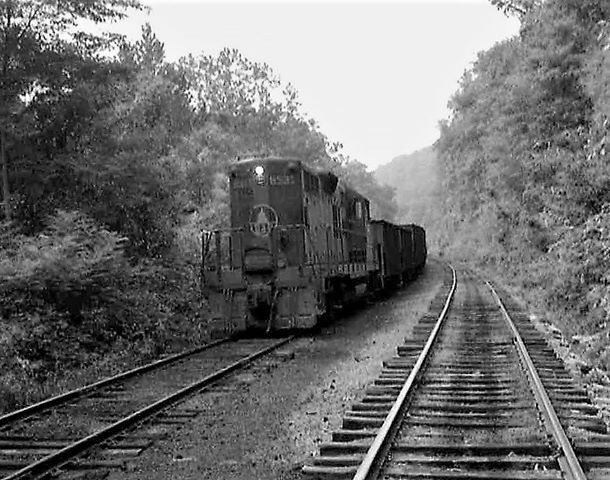 During the mid-1970s, B&O train #62 from Charleston would frequently pick up coal loads at Dundon on its return to Gassaway. Once through freight service to Charleston ended by the late 1970s, Dundon in effect became the western terminus of operations from Gassaway for the B&O. When Majestic Mining ceased operation in 1985, Dundon reverted to a state of rail idleness until the late 1990s when the Elk River Railroad began hauling coal off the old BC&G again. The operations were short lived and Dundon is once again a location of rusting rails and rotting ties as it has been for the past decade. 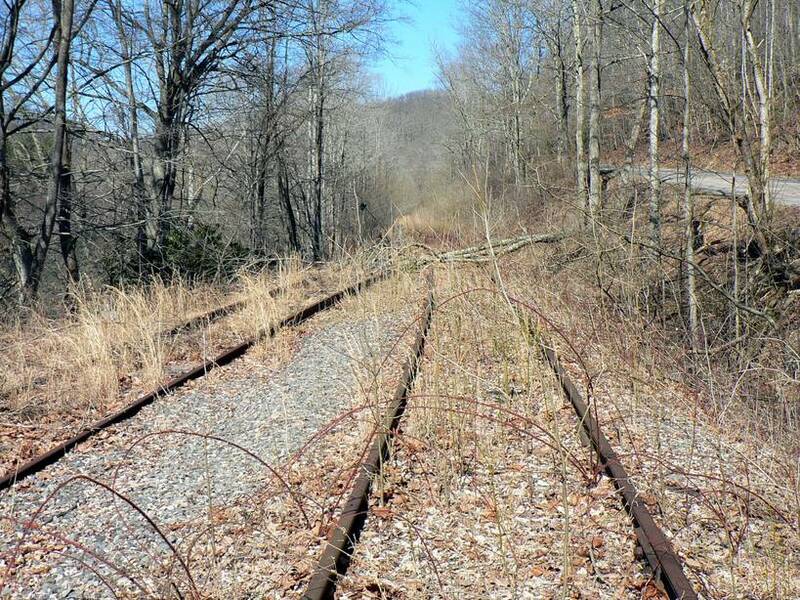 Former B&O rails exist in a state of dilapidation and the only movement at present is the hope of restoring the former BC & G as a tourist line. 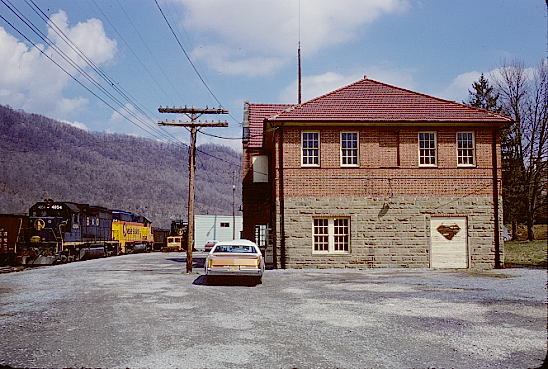 The following group of photos are from the collection of Robert Slavy , a long time railroad photographer in West Virginia, taken during 1980. 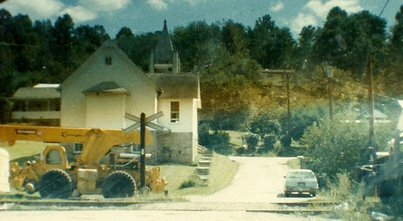 This was a few years after the B&O ceased as a through route to Charleston but activity abounded at Dundon at the former Buffalo Creek and Gauley Railroad interchange with operations at Majestic Mining. My gratitude to Mr. Slavy for the privilege of sharing his work on this page. The significance of Spread was as a passing siding location in a sharp bend of the river east of Dundon. 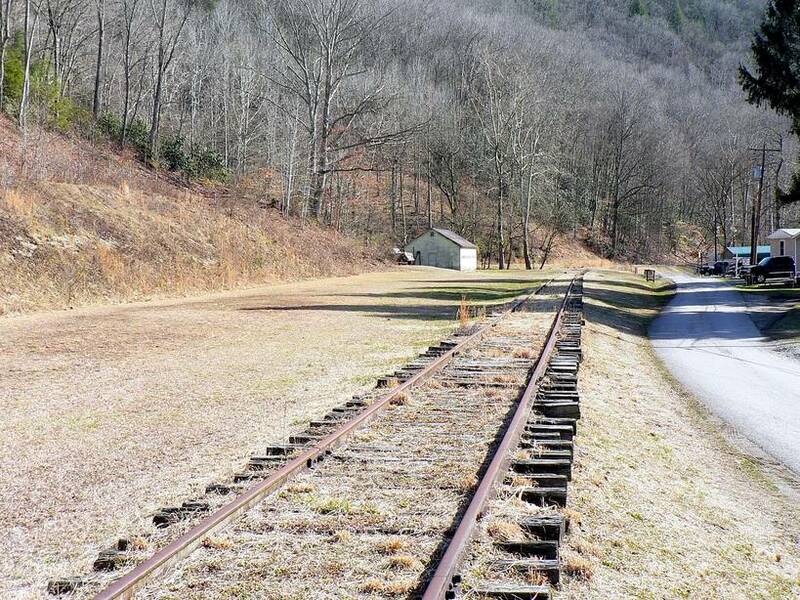 Constructed during the Coal and Coke era, this siding remained active for the B&O well into the 1970s although by this date used for maintenance of way or car storage. This location was also a flag whistle stop during the passenger train era. Moving eastward towards Ivydale (Otter). The Elk River continues to pass through bends but moving east, they become broader. There are few bridge crossings through this region to access the railroad and as a result, a scant number of images to share from this area. Otter was a full-fledged station stop for both Coal and Coke and through the passenger train era of the B&O. There is no record of any on line customers here for the B&O with the exception of its own freight depot (B&O call letter B). A siding was located at Ivydale and I have memories of it in use for storage during the early 1980s. 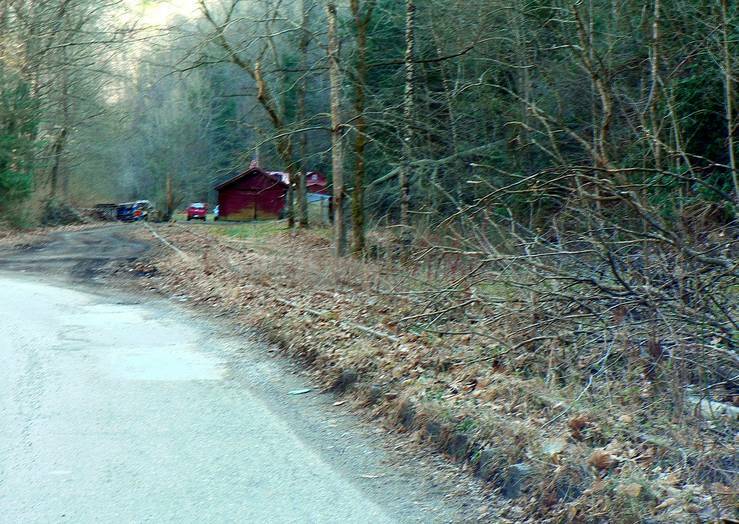 Though they are few in numbers now, longtime residents in Clay and Braxton Counties may have heard about or even recall this incident from many years ago. The winds of change were blowing in along the Charleston Subdivision of the B&O circa 1950. Diesels were beginning to appear and the last passenger trains to run the line between Charleston and Grafton, Trains 135 and 136 respectively, were making their final runs for they would be abolished in 1951. During these waning times, there was an engineer by the name of William Paxton who often was the regular on 135 and 136. Preceding the incident that follows, he had just taken 135 into Charleston and during the layover, it was it was discovered that the regular fireman would not be able to make the return trip the following day on 136. On such brief notice, the railroad had no other alternative but to taxi another fireman to Charleston who could make the run east on 136. The fireman who would make the run with William Paxton on that day’s 136 was a relatively new employee on the B&O named Paul Duffield who to date had very little experience as a fireman. Once Train 136 departed Charleston for the run to Grafton, Mr. Duffield would later experience a traumatic occurrence that no railroad crewman would ever wish to experience. Train 136 ran eastward from Charleston without incident on what had the appearances of just another daily run to Grafton. 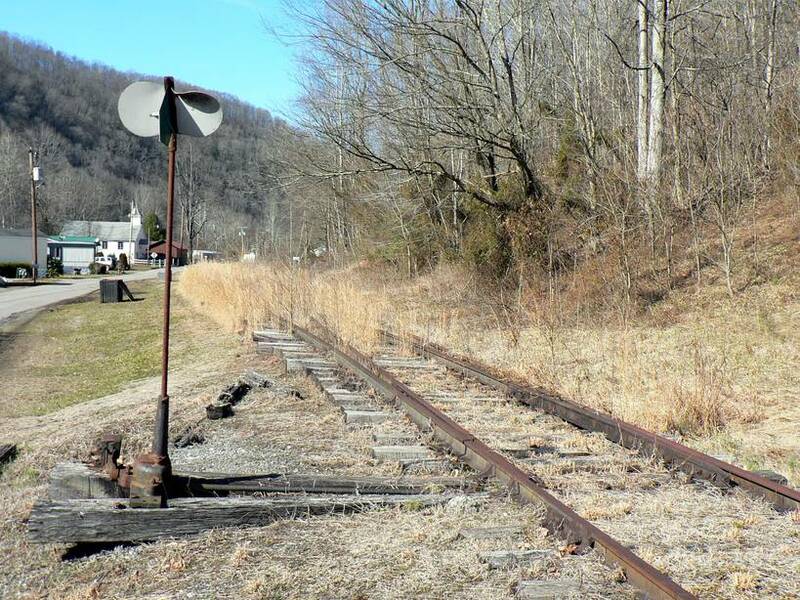 Stops completed at Clendenin and Clay and the smaller whistle stops in between. Eventually, the train arrived at the Otter (Ivydale) station stop for passengers and to take on water. Shortly thereafter, the train departed from Otter and Mr. Duffield was tending to his duty as fireman feeding coal to the 4-6-2 Pacific class locomotive. The train had achieved a good rate of speed when he noticed that Mr. Paxton, the engineer, had slumped forward and the fell from his seat. Obviously, there was something seriously wrong and immediately Duffield went to his aid. Upon examining Mr. Paxton, he determined that he had died and during these traumatic moments, the train was still under throttle and moving at a good rate of speed. Though shaken, Duffield repositioned Mr. Paxton in order to reach the throttle. Instinctively, he was able to close the throttle and apply the brakes bringing the train to a stop. Serving as conductor on this train was Charley Cogar who was also a qualified engineer. He had been summoned by Duffield to the engine cab where he confirmed that Mr. Paxton had indeed passed on. 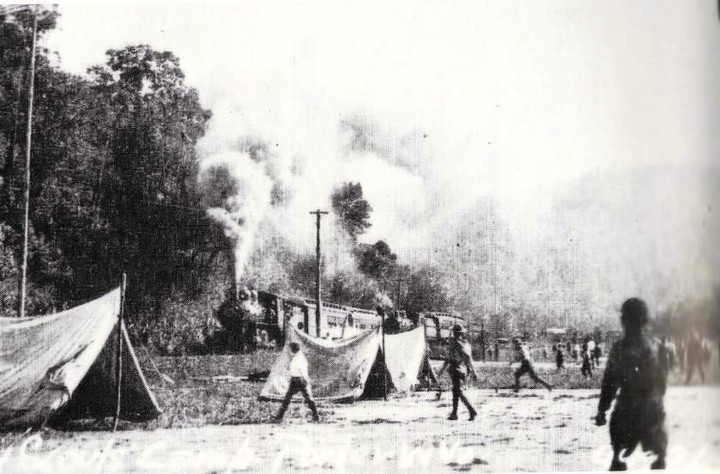 Cogar then assumed the role of engineer and took the train to Frametown where railroad officials were immediately notified of the tragic events. Paul Duffield was a hero this day in that he responded to a tragic situation under traumatic circumstances with little experience and averted further tragedy by preventing a train derailment. There is no doubt the memory of this fateful day remained throughout his life. This account and two others, Big Sycamore Derailment and 1950 Elkhurst Trapped in the Snow, are but three documented events that occurred along this railroad. There are without question uncounted other ones that were not recorded and remained only in the memories of those men who were party or witness to them. Sadly, most of those accounts will be lost to the ages for so many have passed from the scene now. Moving eastward through Groves, Villa Nova (Duck), Strange Creek and Glendon. These locations were station and flag stops for passenger trains with little on line traffic except for logging lines that ran along Groves and Strange Creeks early in the 20th century. 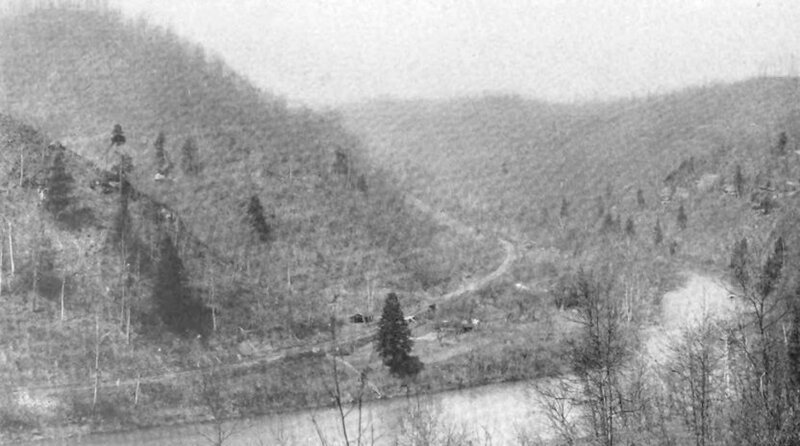 "The Elk River, seventy miles above its mouth at Charleston, in that wildly picturesque portion of central West Virginia, makes an abrupt bend in its course, where the waters, now with impetuous rush, now in placid pool, are baffled and turned to the right in a graceful semi-circular sweep of almost a mile, by beetling cliffs rising sheer from the river level, to an elevation of several hundred feet. These cliffs and their huge rocks, which, in the ages, have fallen away and found lodgement in and along the side of the stream, to the pioneer raftsman, as his craft swept into the curve from upriver, gave the distinct impression of having reached an insuperable barrier to his further progress--a cul-de-sac, or the jumping off place; hence from the earliest history of the country, that locality has been called, and still bears the name---"The End of the World". The beautiful river and the fishing shack nearby at the lower extremity of the curve described, where the curvature reverses and turns the other way with scarce less freakish trend, are the subject of these verses. "To him who in love of nature holds communion with her visible forms and can both speak and interpret her language--these lines are dedicated". Mr. Byrne was laid to rest in Spring Hill Cemetery at Charleston in a plot overlooking his beloved Elk River. As the railroad directly parallels the "End of the World" many folks, passenger and train crew alike, must have gazed upon the river here with sheer awe realizing it is a true marvel of creation. Not a vivid photo but still captures the "End of the World " region west of Groves. 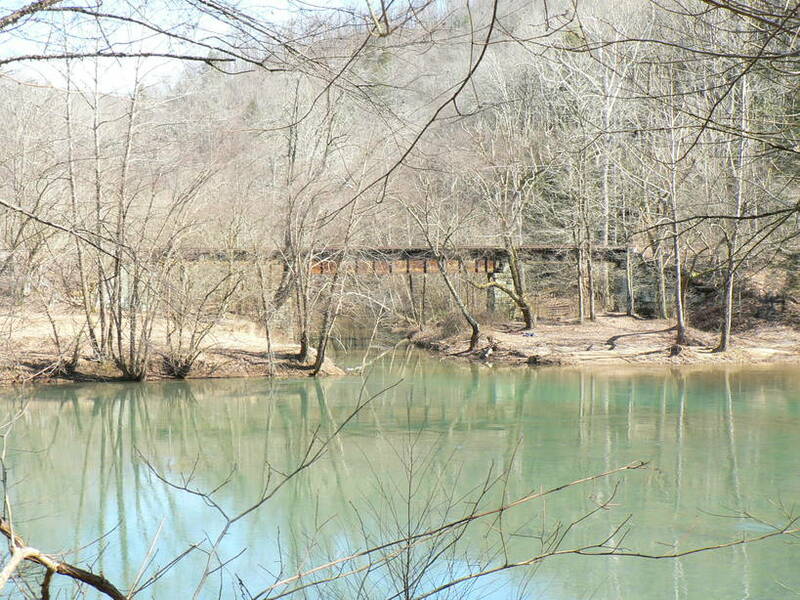 View is railroad west with the Coal and Coke Railway/B&O following the bends of the Elk River at left. Image West Virginia Geological and Economic Survey. Situated in the heart of the "End of the World" region, Groves was a flag whistle stop for passengers lasting into the B&O era. 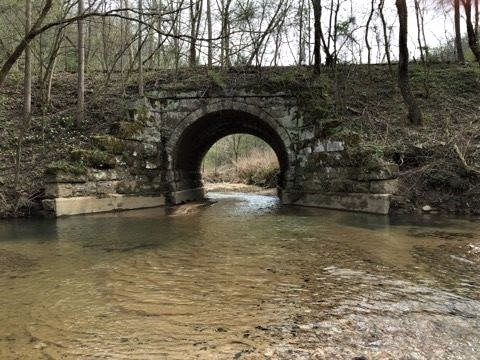 During the early 1900s, a small lumber railroad ran along the creek that connected to the Elk River line at the mouth of the creek. 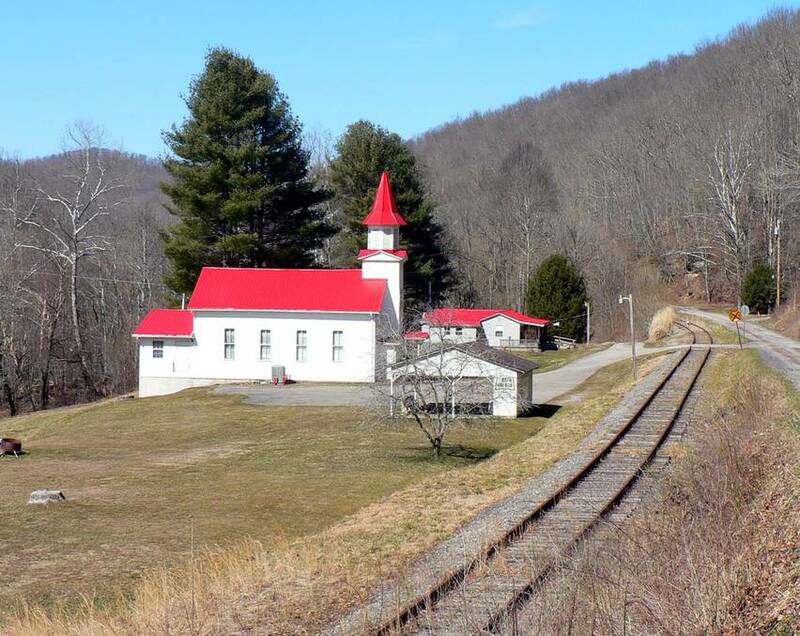 Situated at the Clay-Braxton county line, this small community by either name was once served by a depot (B&O call letters VN) and a siding still exists at this location today although in disrepair as is the main line. The location was originally named Duck because of the flocks of ducks that would take refuge in an island in the Elk River near there. The place location used by the railroad dating back to the Coal and Coke Railway was changed to Villa Nova by Henry Gassaway Davis. He did not fancy the name of Duck as a stop along his railroad and therefore changed the name. The significance of why he selected Villa Nova is not recorded. B&O continued with the change using Villa Nova as the place name in its timetables. 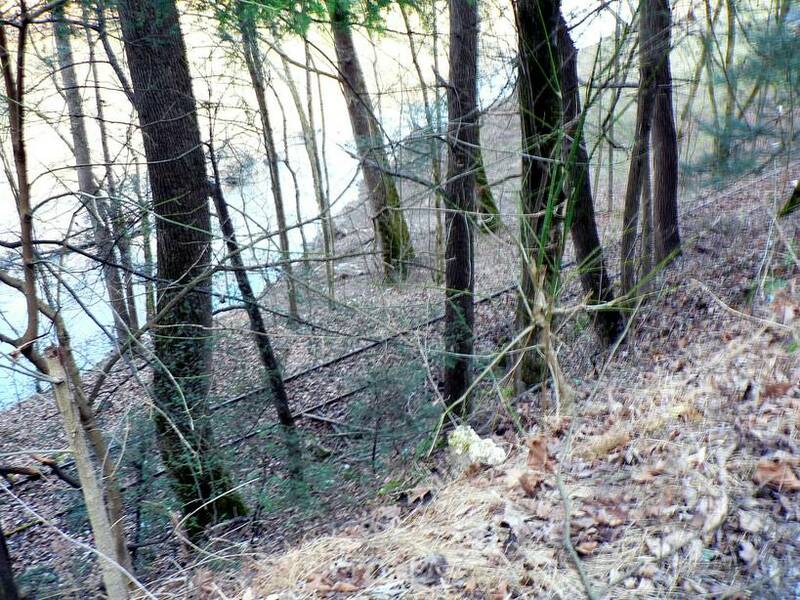 It was this area that nearly led to a resurrected Elk River Railroad during the 1990s when the proposition of opening new mines in the region surfaced. Not only did this create the feasibility of generating traffic east to Gassaway but also west to Charleston with a rebuilt railroad west of Hartland. These hopes were dashed when the coal was discovered to not be of suitable quality. 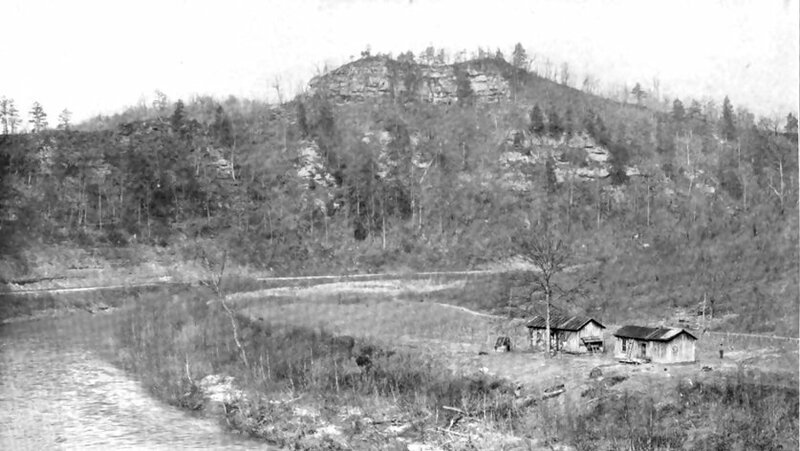 The Elk River Valley was populated with independent coal operators during the Coal and Coke Railway years lasting into the early B&O era. 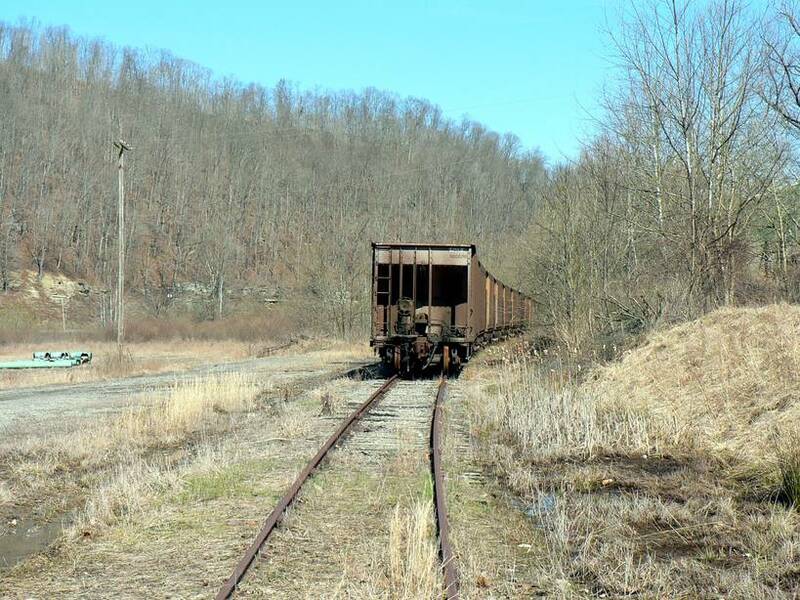 Although the region in Braxton County along the railroad was not as active with mining as neighboring Clay County to the west, there was sporadic mining scattered about. During the 1920s the W. A. Merrill Coal Company operated mines in the vicinity of Duck. 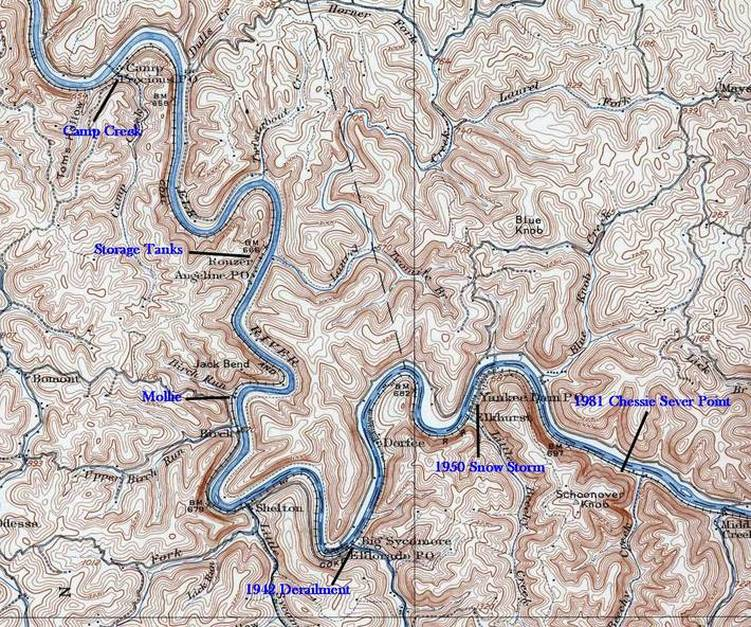 During the early 1900s, a rail branch line extended up the Strange Creek basin for the extraction of timber but as with many other logging lines, it soon disappeared. 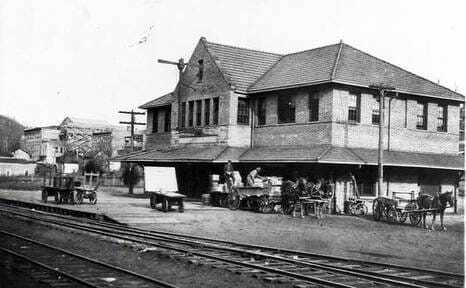 There was a depot located (B&O call letters SC) here until it was demolished in 1942. B&O had no customers located here but a stub ended siding was in place for storage purposes. The railroad crossing of Strange Creek is on a deck bridge. In 1795, surveyors from the State of Virginia came upon the bleached skeleton of a man and a dog found at the base of a beech tree in which the words above were inscribed. The man was William Strange and he became lost after being separated from his hunting party. 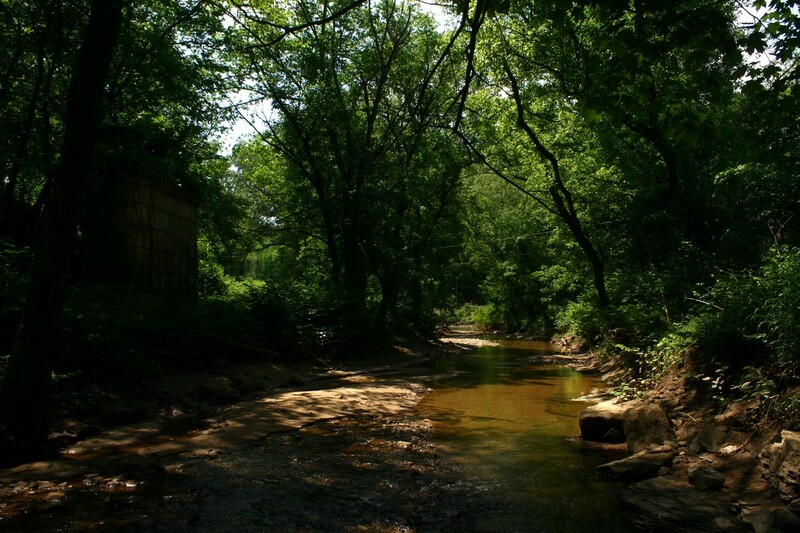 Located at a creek mouth at the Elk River, legend has it that this how the creek and community received its name. Glendon was merely a place name for the B&O aside from a flag passenger stop many years ago. Early in the 1900s, there was a short siding located along the east bank of the Birch River. There is no indication what this may have been used for whether it was storage track or perhaps a small business. Opposite view at Glendon running eastbound. 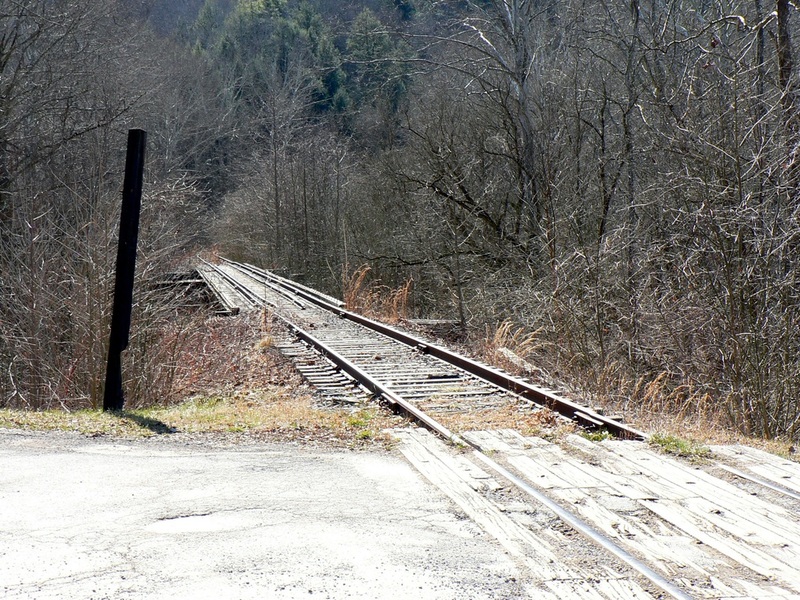 The rusty rails during the time period concur with the idle transition period from Chessie/CSXT to the Elk River Railroad. No coal was originating from the former BC&G during this era either. During my exploration of this area in 1990, it was apparent that track work was done at Glendon within the recent past. 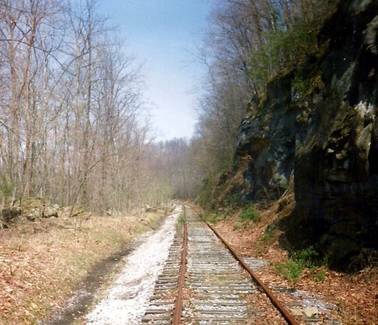 The condition of the track and right of way here was significantly better than at other locations and perhaps, the last major maintenance conducted by the Chessie System on this region of railroad during the mid- 1980s. This section of the 1908 topo map covers the region from the east of Glendon into Gassaway. Frametown is the most notable place name between the two points and is referred to as more widespread than indicated on the map. 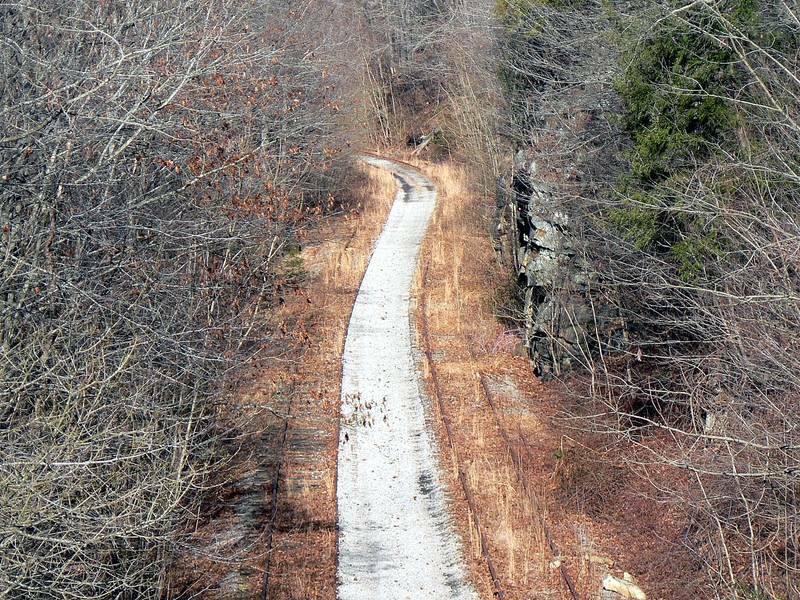 Aside from Frametown, flag whistle stops dotted this stretch of railroad along the Elk until Gassaway. A "linear" Interstate 79 is added for modern day reference. 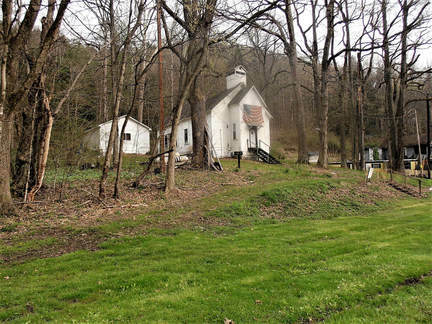 In a region that is recorded as being settled in 1798, the location was first known as Frames Mill until eventually being changed to Frametown in honor of its founder, James Frame, Sr. For a small community, it extends for several miles with various references to Frametown scattered along State Route 4. Frametown was the last passenger stop moving eastward before arriving at Gassaway lasting into the B&O era. 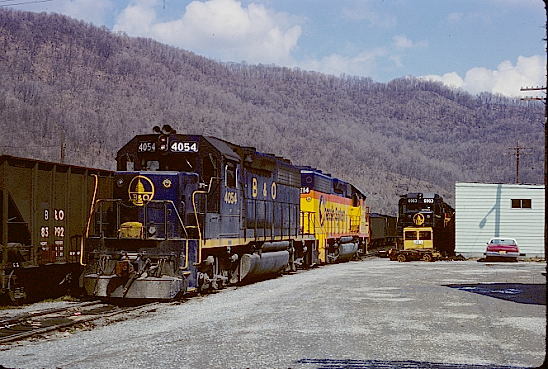 In fact, in terms of freight, the depot (B&O call letter F) was among the final ones to remain active between Charleston and Gassaway existing at least until the late 1950s. There also were also shippers in the region which lasted until the final years of the Chessie System. 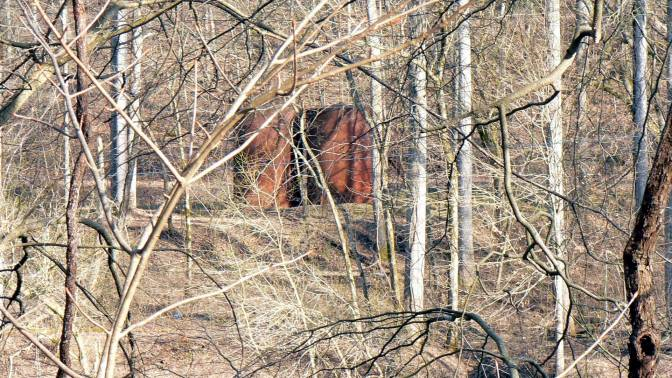 Today, car storage by the Elk River Railroad occupies the former mainline extending west from Gassaway to the vicinity of Frametown. A view looking westbound at Frametown. The area to left of the track looks like where both a siding was and perhaps the location of the depot although I could not confirm this. Gassaway at its zenith. The shops of the Coal and Coke Railway dominate the foreground with the yard behind. The railroad is in transition as the B&O is taking control in this circa 1917 photo. This view looks north and the Sutton Branch is visible following the Elk River at left. Image West Virginia Geological and Economic Survey. The town named after Senator Henry Gassaway Davis, builder of the Coal and Coke Railway, proved to be geographically fortunate for it was virtually at the midway point between Charleston and Elkins. As fate would have it, the Elk valley with its narrow confines, widened here creating a wider plain on its north bank which proved ideal for locating shops and a yard. 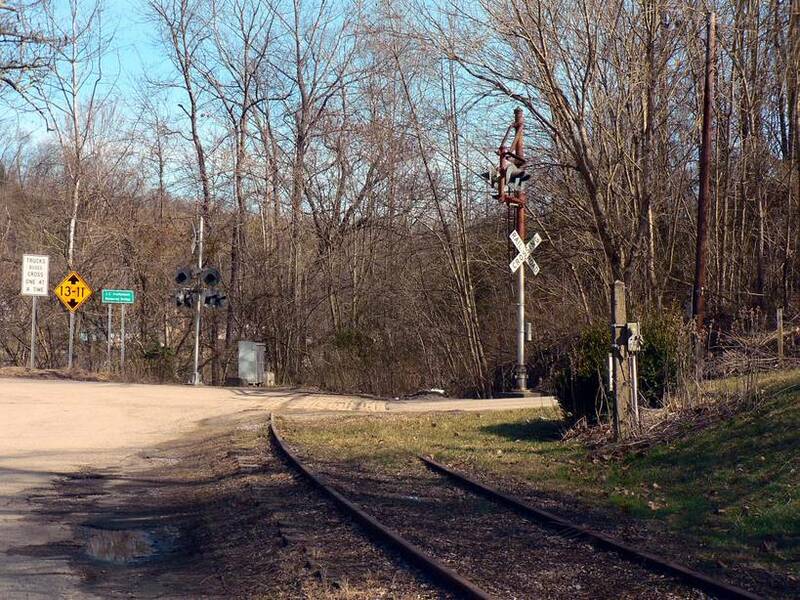 In later years, this location sufficed for the B&O as the central operations point (B&O call letters GA) between Charleston and Grafton as Gassaway was the staging and termination point for trains to and from Charleston on the Elk River Subdivision. This also meant that it was a crew change point for the continuation of trains in either direction. Google Earth image of Gassaway looking in the opposite direction from image at left. The wider river plain--and central location-- was an ideal spot for a yard and shops built during the Coal and Coke era on its Charleston-Elkins route. 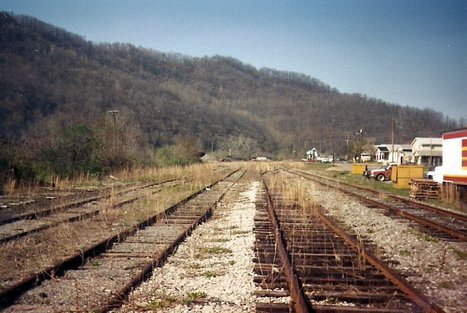 The red line traces the route of the former branch to Sutton and cars are visible in the yard stored by the Elk River Railroad. Left: Gassaway was still a busy location when this circa 1975 photo was taken. This westbound view reveals coal hoppers that populate the yard and the manifest freight cars indicative of trains still operating to Charleston. 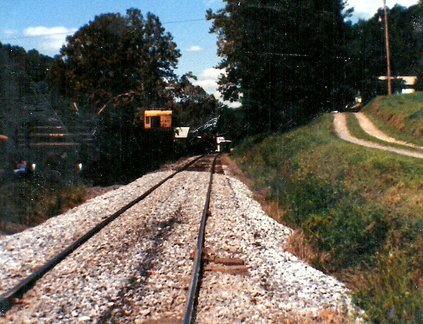 At bottom of photo can be seen the Sutton Branch diverging from the main in the east end of the yard. To the right, the plain between the railroad and the Elk River that once contained the Coal and Coke Railway facilities from earlier times. Image Arnout Hyde, Jr. /courtesy of Teresa Hyde. If one is an admirer or historian of the Chessie System, Everett N. Young needs no introduction. His photos are well known and have appeared in numerous publications about the Chessie era. I am deeply grateful for his permitting me to share a few period images here. 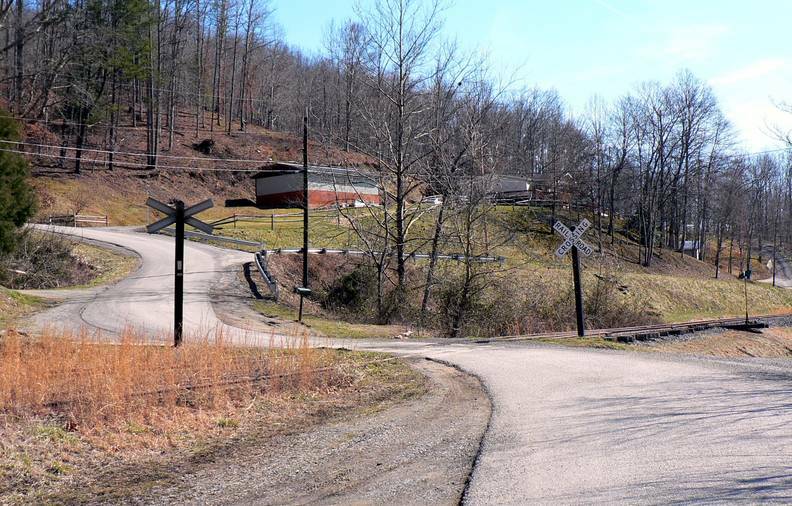 Gassaway was not unlike any other railroad town in that its economy was directly aligned with the fortunes of the road. The peak years were during the steam era when there were more trains and the affiliated operations that kept steam locomotives maintained. This meant more crews and employees that worked the yards and shops. The winds signaling the beginning of the decline truly began during the 1930s when B&O began to abolish passenger trains not only affecting Gassaway but system wide. By this date, the American highway system was both expanding and improving and it was the trains on the secondary lines that took the initial hit as travelers began the exodus from train to automobile. There were fluctuations in the coal industry throughout the years due to economic conditions and times of labor unrest. 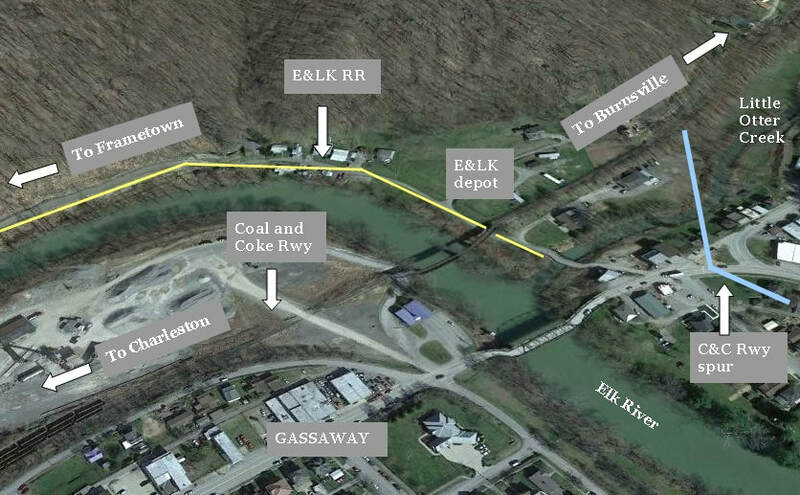 Gassaway was totally dependent of the traffic funneling in and out of its yard from the various branch lines that connected with the Elk River line which generated the carloads. Manifest traffic was more consistent serving the customers from Gassaway to Charleston. But by the mid-20th century, this also began to wane. At the midway point of 1950, there were still four scheduled freight trains that ran between Charleston and Gassaway and two passenger trains. The two passenger trains, #135 and #136, were in twilight and would be abolished within the next year ending all service from Charleston to Gassaway and points beyond. 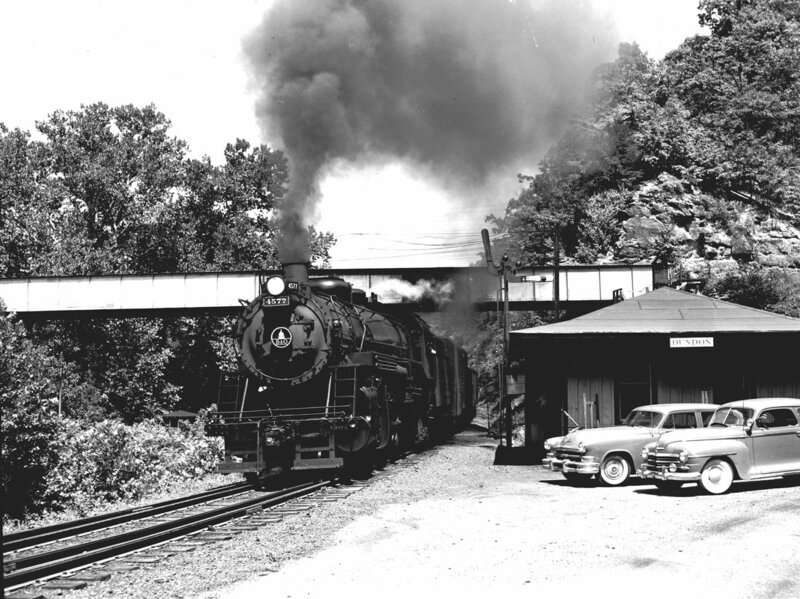 Perhaps the heaviest economic blow to hit Gassaway was during the 1950s when B&O was transitioning from steam to diesel thereby eliminating the servicing facilities and number of crews. This translated into lost jobs that would not be replaced. Gassaway made an attempt to use the former shop buildings to attract another type of business but to no avail. The Gassaway shops were ultimately razed and all were gone by 1961. 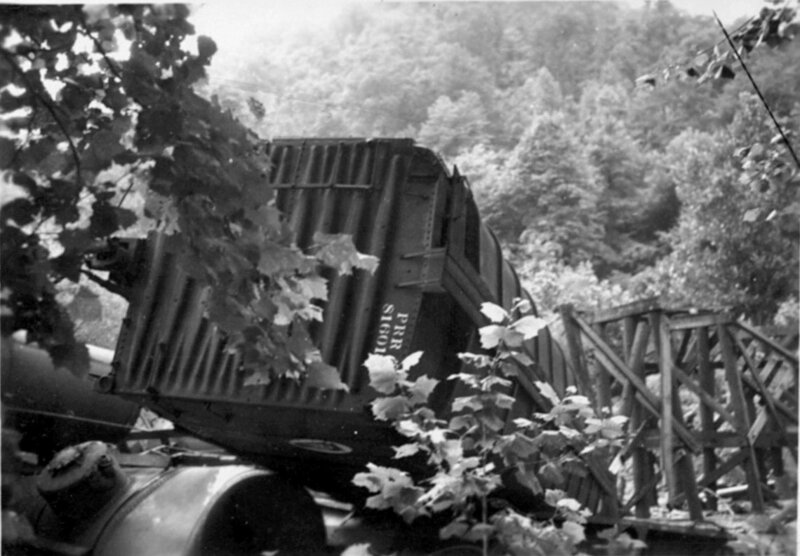 The shutdown of the Buffalo Creek and Gauley in 1965 and the last loads of coal coming off the old Middle Creek Railroad that same year severely reduced the number of carloads coming into Gassaway. Manifest traffic had also declined to the point that two of the Charleston trains had been abolished leaving only one each way. 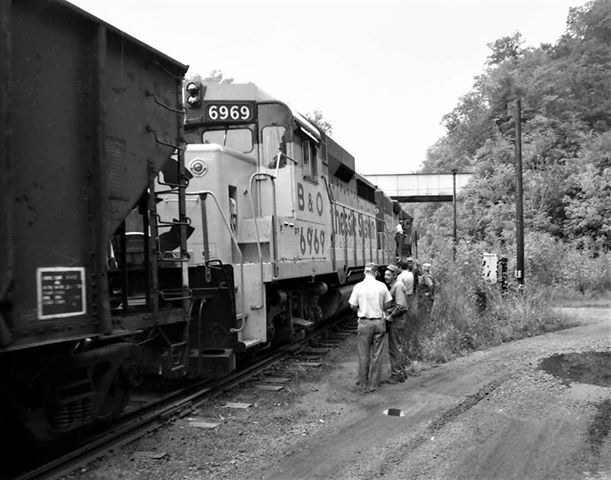 By 1970 the remaining manifest trains, #62 and #65, operated on alternating days to and from Charleston with a Train #61 running west to Gassaway. In 1971, a small boost in the form of coal again came from the old Buffalo Creek and Gauley under the new ownership of Majestic Mining which operated until 1985. When the B&O ceased running trains to Charleston once the line was severed between Hartland and Reamer, this effectively ended the manifest traffic at Gassaway barring a few local shippers along the route. Even prior to the cutting of the Charleston line, merchandise traffic to and in the capital city seemingly dried up overnight as it rapidly declined in the late 1970s. What remained could be serviced by the C&O from the Charleston end as previously noted. The swan song for Gassaway as a Class I railroad location coincided with the demise of the Baltimore and Ohio Railroad/Chessie System when it was consolidated into CSXT in 1987. Coupled with the shutdown of Majestic Mining on the old BC&G which ended coal traffic moving into town from the west in 1985, Gassaway as a prominent location on the railroad was doomed. 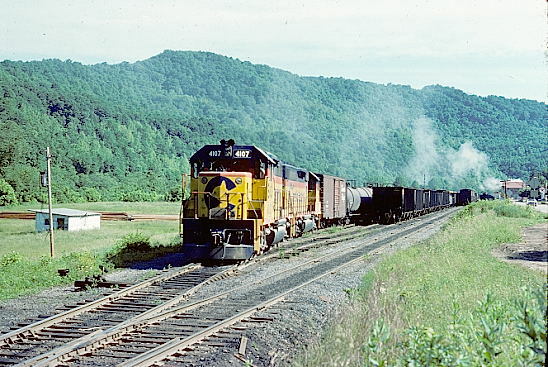 CSXT had no interest in keeping a line that was not generating traffic and the railroad between Gilmer and Hartland was subsequently sold to the Elk River Railroad (TERRI) which also acquired the former BC&G. Gassaway saw the return of coal during the late 1990s when coal once again funneled in from the old BC&G. Unfortunately, this was short lived and the railroad now operates in a near state of dormancy only generating revenue for car storage as it has since 2001. Today there are still railcars in the yard at Gassaway but it is not bustling with activity. GP9 #4 is tied down in the Gassaway yard with a string of empty coal hoppers for storage. One of five locomotives on the roster consisting of two GP9s and three GP10s, the #4 is the only one I was able to photograph on this outing. The outlook is quite gloomy now for the development of any on line revenue on this railroad in the foreseeable future but with the right circumstances...perhaps. 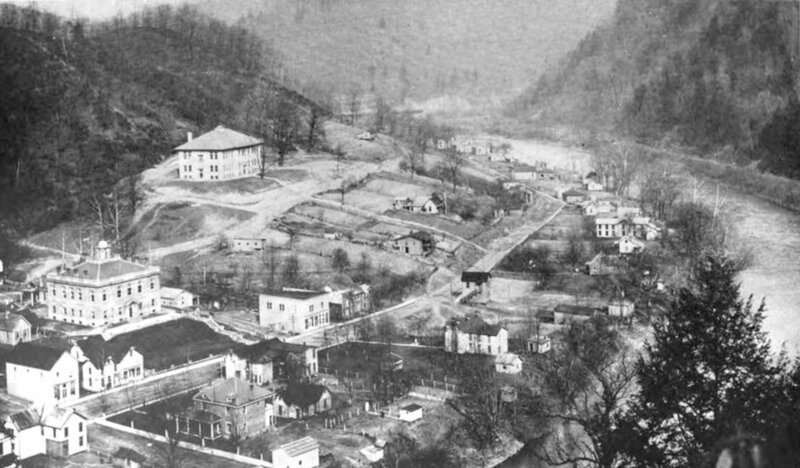 The county seat of Braxton County was settled in 1792. Today it is probably best known for Sutton Lake which was created in 1961 for the primary purpose of flood control on the Elk River. 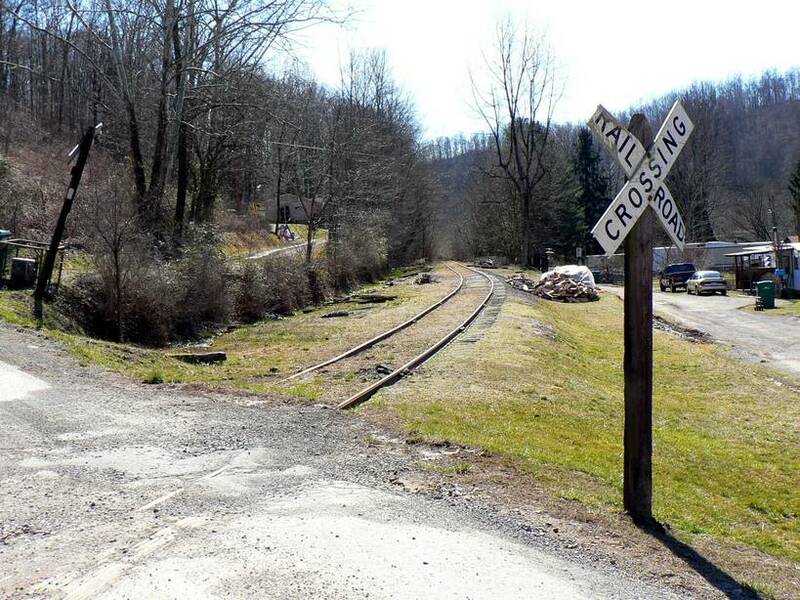 The West Virginia & Pittsburgh Railroad was the first to reach Sutton when rails were laid into the town in 1898. 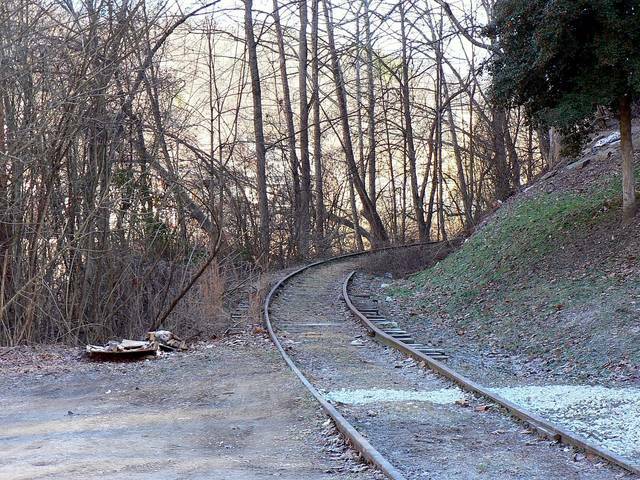 Within a few years, the Coal and Coke Railway constructed its own branch diverging from the mainline at Gassaway and extending six miles to serve the town. 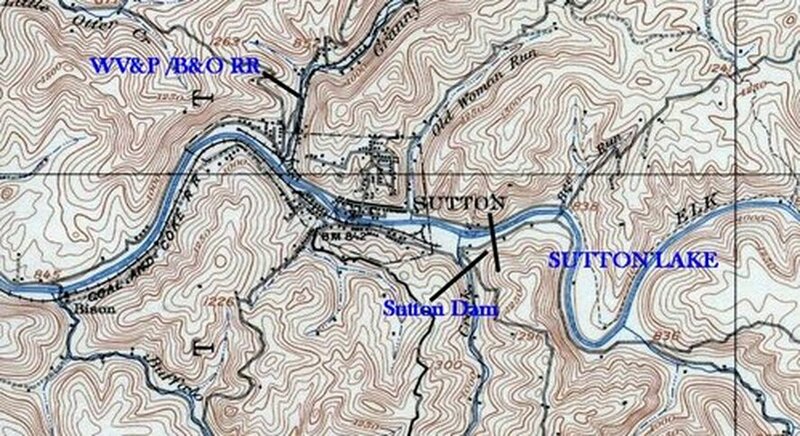 1908 topo map of Sutton which includes the two railroads that existed in town at that time. 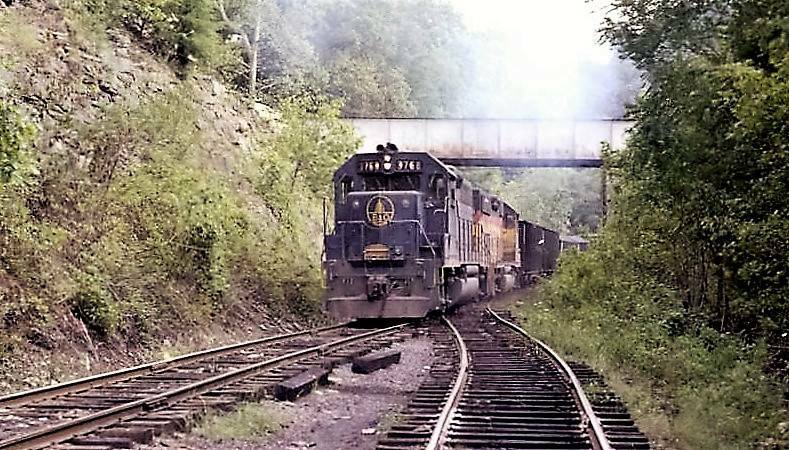 The former West Virginia & Pittsburgh line that became B&O entered from the north and lasted until the early 1930s. The former Coal and Coke which obviously became B&O as well follows the Elk River into town. The river channel to the east of town is now submerged in the depths of Sutton Lake. Sutton as it appeared circa 1916. 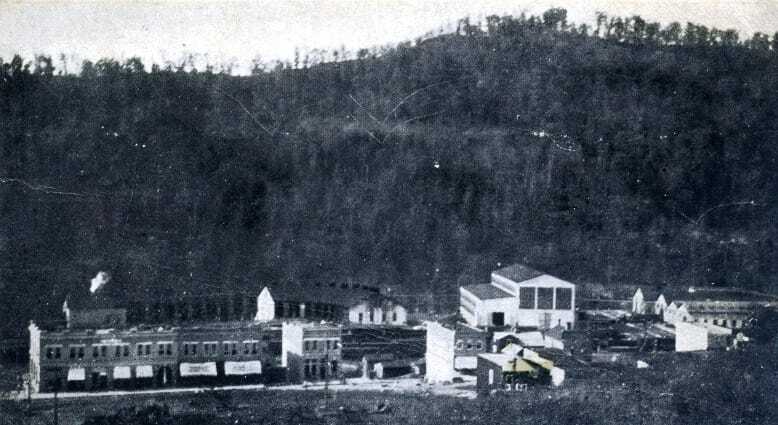 Near the town center at this date was the original West Virginia and Pittsburgh Railroad now owned by B&O. 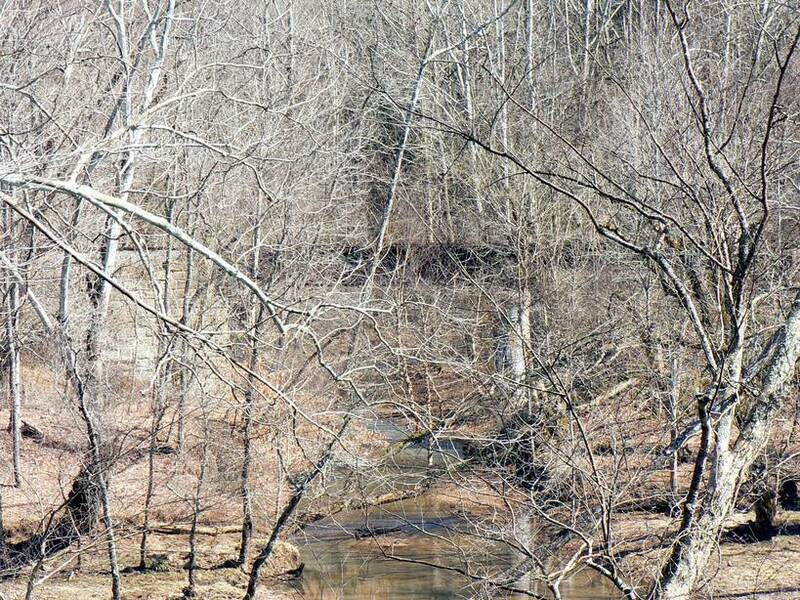 Out of view in this scene is the Coal and Coke Railway branch from Gassaway on the near bank of the river later acquired by B&O. The Elk was still a wild river at this date for Sutton Dam was a couple of decades into the future which would tame its waters. Image West Virginia Geological Surveys. Another rare view of Sutton taken along the south bank that captures the Coal and Coke/B&O Sutton Branch and the Sycamore Street area as it was in 1917. View looks east of at the town flanking both sides of the Elk River. Sutton Dam would tower at upper right in a photo taken from this location today. Image West Virginia Geological and Economic Surveys. 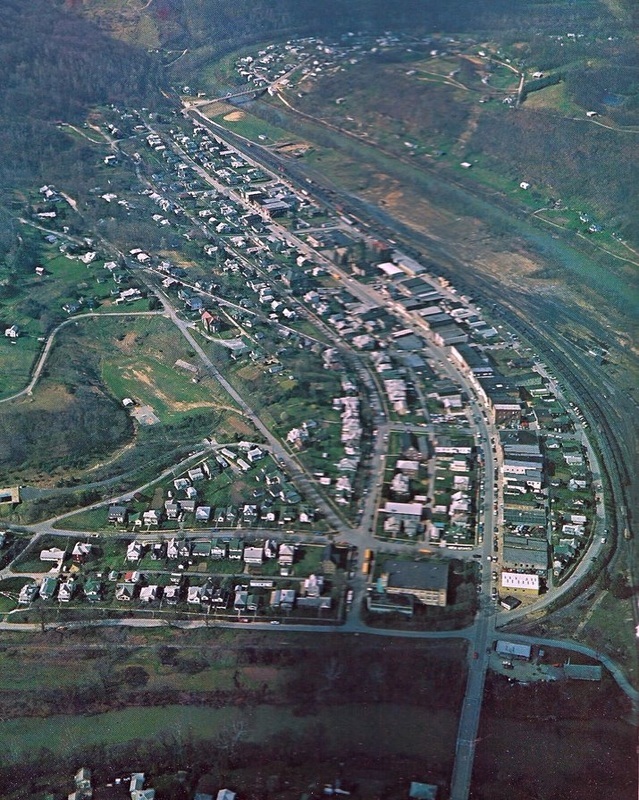 When the B&O acquired the West Virginia & Pittsburgh line extending from Flatwoods to Sutton and later, the Coal and Coke Railway, it was in the unique position of serving the town of Sutton from two rail lines on opposite sides of the Elk River. 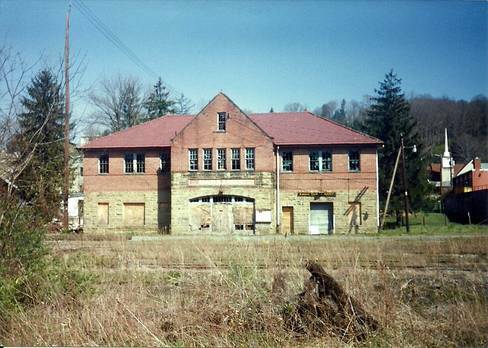 The B&O ultimately abandoned its former WV&P branch and retained the line from Gassaway to Sutton. A wye was constructed at the end of the Sutton Branch in order to turn locomotives. Being among the larger population centers in the region served by the Coal and Coke and later B&O, it was naturally a larger source of passenger traffic. As an agency location, its designation by the B&O was SN. 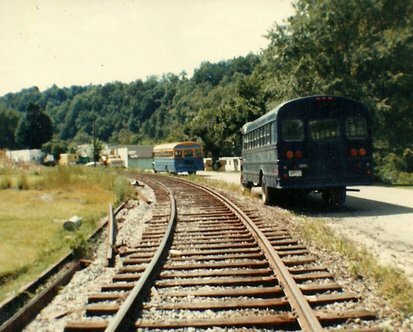 The branch continued to serve Sutton area shippers to near the end of the Chessie System era. 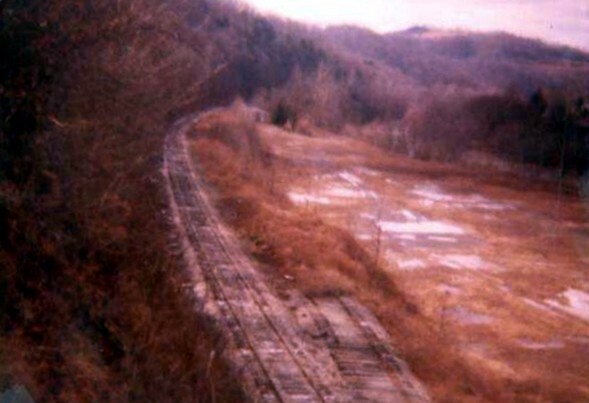 During the mid-1980s, the line was eventually abandoned and the rails removed. 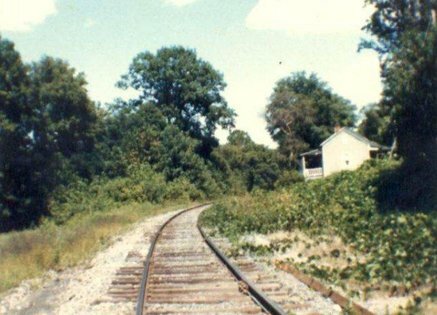 During my trips to the Sutton area while on the job during the early 1980s there was a hope of at least one time witnessing a moving train on this branch. In my collection of photos from this era were shots of an occasional railcar on the branch as well as images from the Gassaway yard. Unfortunately, these were among the group of my photos from the 1980s that were destroyed. 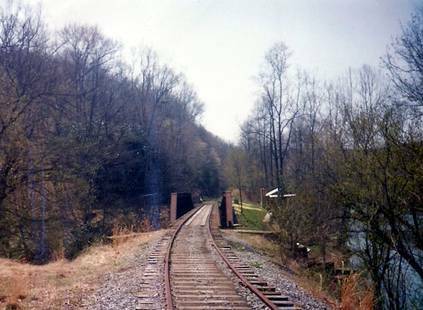 The B&O Elk River Subdivision from Gassaway to Charleston is symbolic of a number of secondary rail lines that once existed in America. Built to either serve an industrial region or to tap natural resources for the raw material of industry, they fulfilled a purpose in the development of the country. Added to this was rail being the primary means of travel. Once all these elements peaked, there was nothing left but gradual yet inevitable decline. The Elk River line actually peaked during the Coal and Coke era and this crest lasted into the early years of B&O control. By the time the B&O assumed complete ownership of the route, the first sign of decline manifested itself with the beginnings of reduction in passenger service. The region was rich in natural resources. First timber, then coal, and for a brief period of time, a great oil boom. 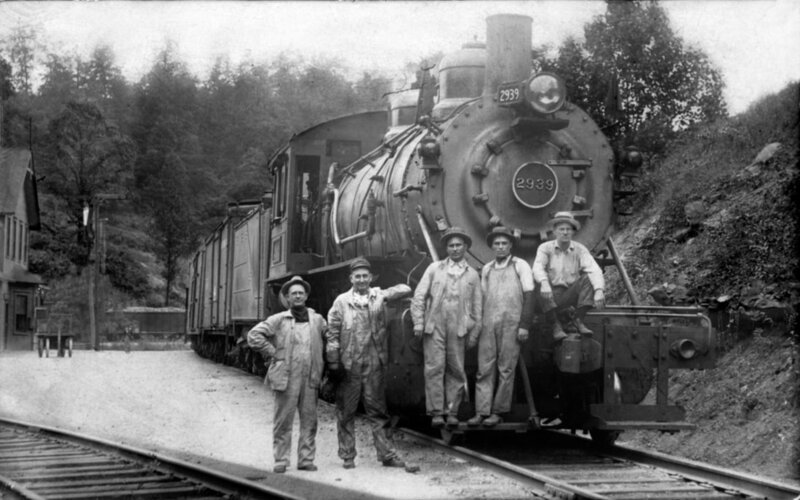 For much of the 1900s, the railroad was the means of shipping these raw resources until they either played out or it became economically unfeasible to extract them on a large scale. The Elk River route lived and died on this premise. But raw resources still remain in the region traversed by this railroad. Unlike a multitude of other rail routes that have been abandoned throughout the years, there is still a potential for a revival in some form. Given the technological developments in mining and oil extraction in recent years, it could be economically viable to once again give this region another look. Of course, other facets come into play of which none is more important than the political climate to support it. Whether trains will run again along the Elk---be it a Charleston, Blue Creek, and Sanderson or a rejuvenated Elk River Railroad--- is a rhetorical question at this point in time and to say the outlook is more than gloomy would be overly optimistic. If the railroad still existed in its entirety today, it would be a prime candidate for a scenic excursion train providing facilities to support it were feasible. The natural beauty of the Elk River and valley would be an utterly beautiful sight and attraction in the autumn. The small communities could have benefited from this as well---any economic shot in the arm would be a plus. But a revived railroad carrying revenue freight on a consistent basis would do much more. I am grateful to the individuals and sources listed below. Without them most of the piece would not have been possible. Special thanks to Jeanie Droddy/Herb Wheeler for their contribution of bridge and right of way images along this route.